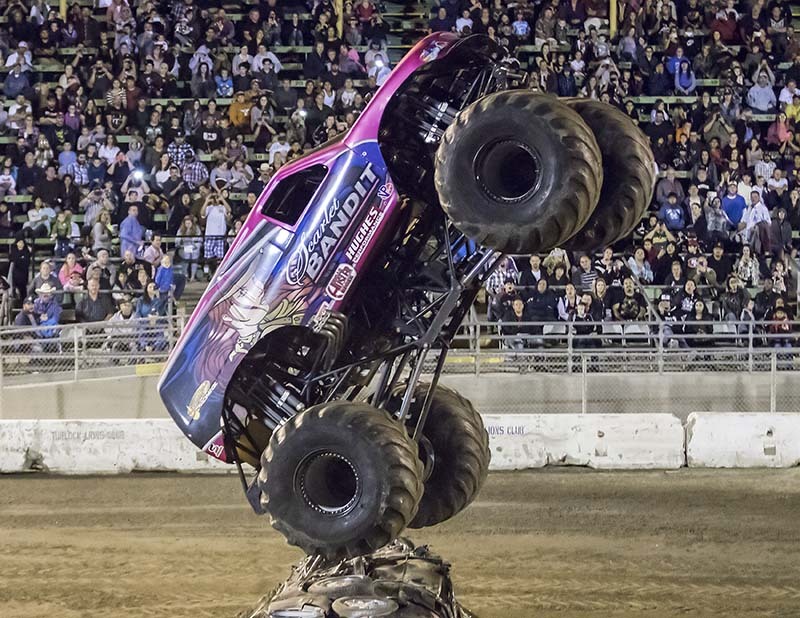 This time on “The Allen Report”, we go to the Arizona State Fairgrounds, a venue that has pretty much seen it all for the past one-hundred and thirty years, from the pre-war capital of motor racing in the city of Phoenix to a premier rodeo venue. 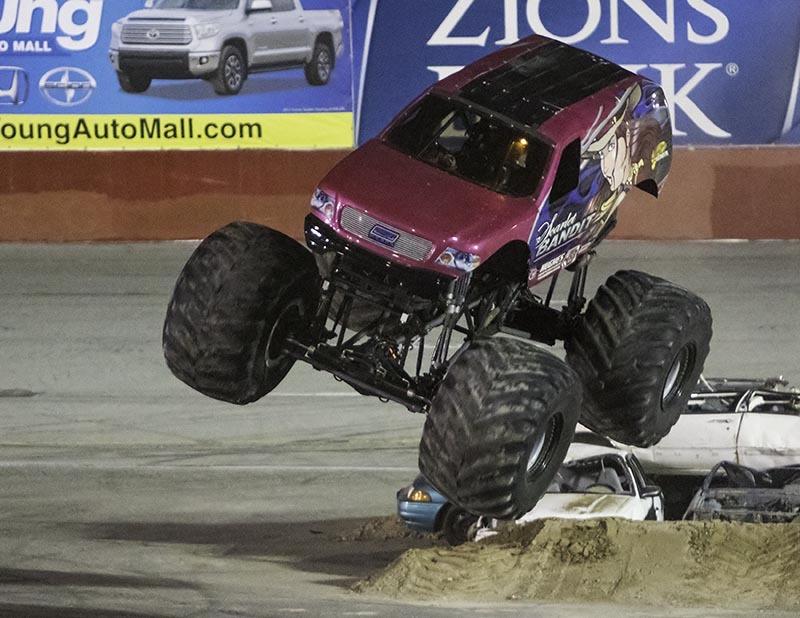 And, of course, the Sanderson Ford Arena has seen no shortage of monster truck action, as it did over the fair closing weekend Friday, Saturday and Sunday. 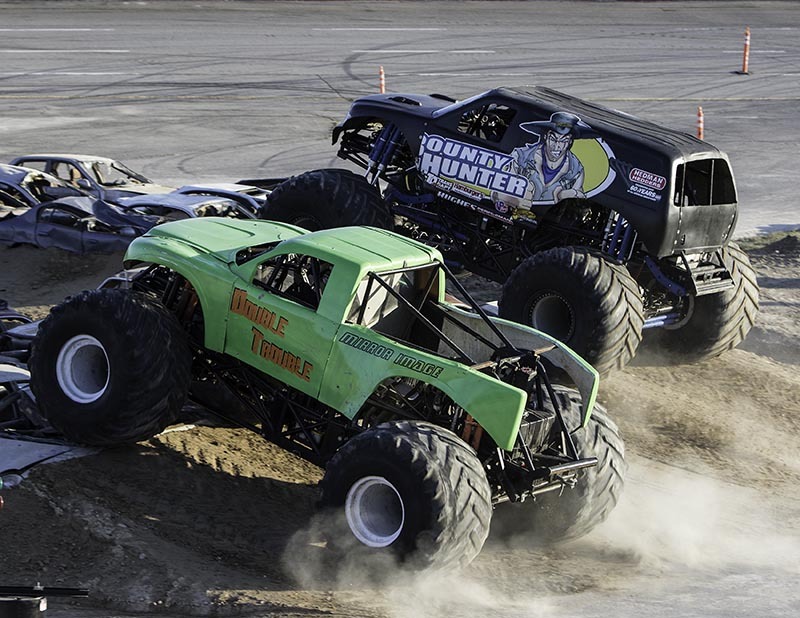 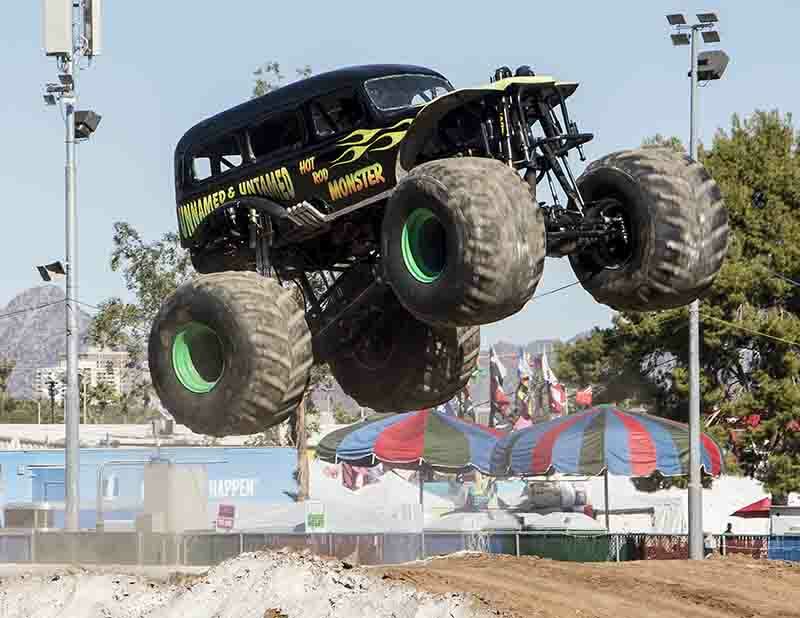 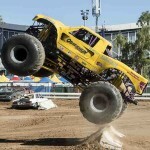 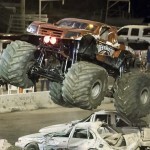 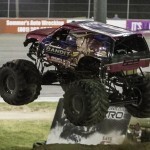 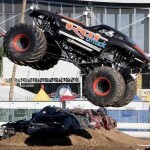 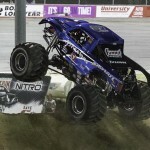 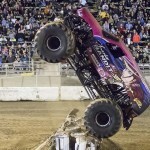 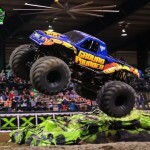 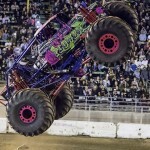 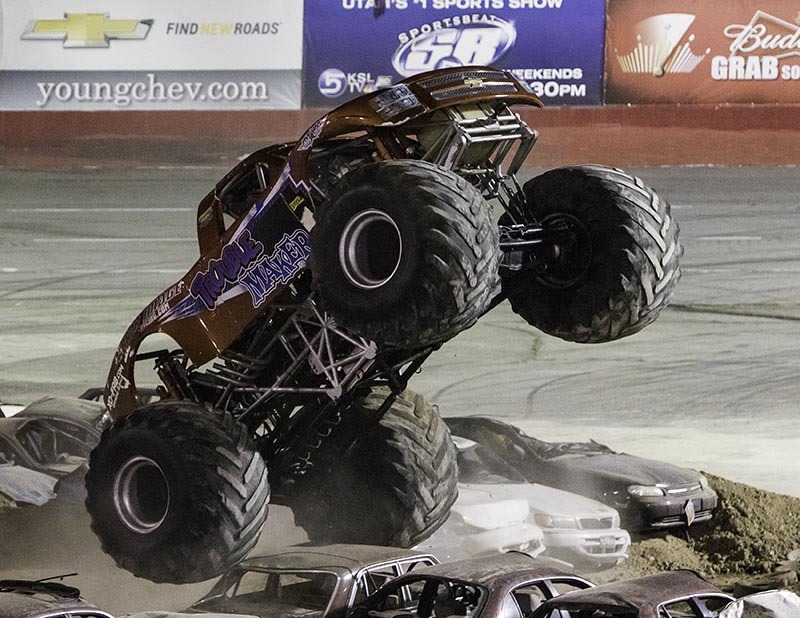 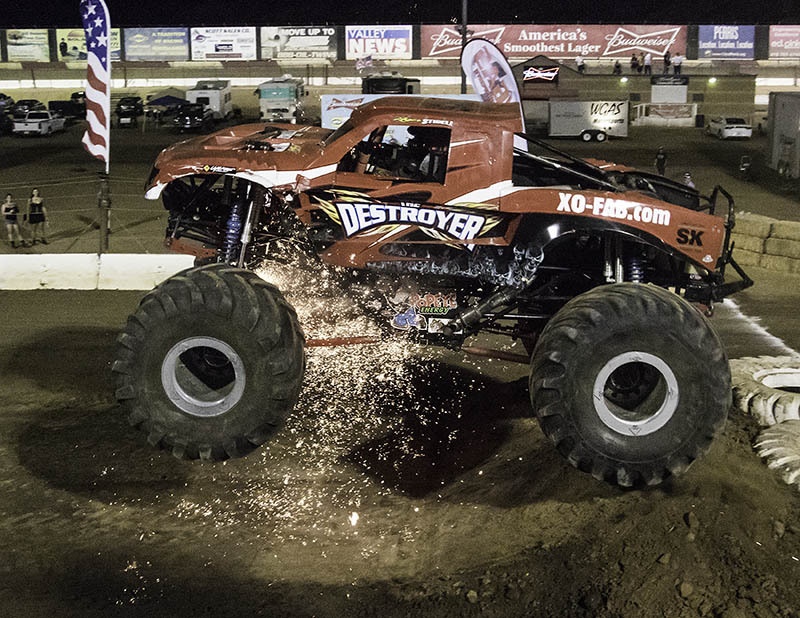 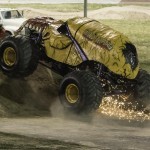 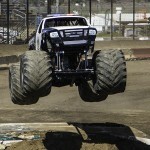 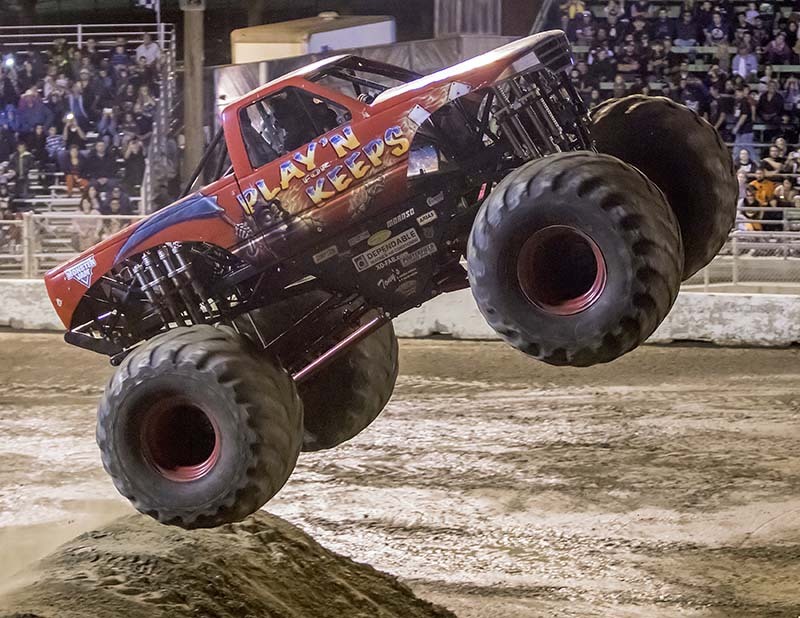 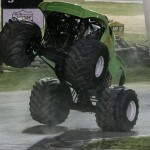 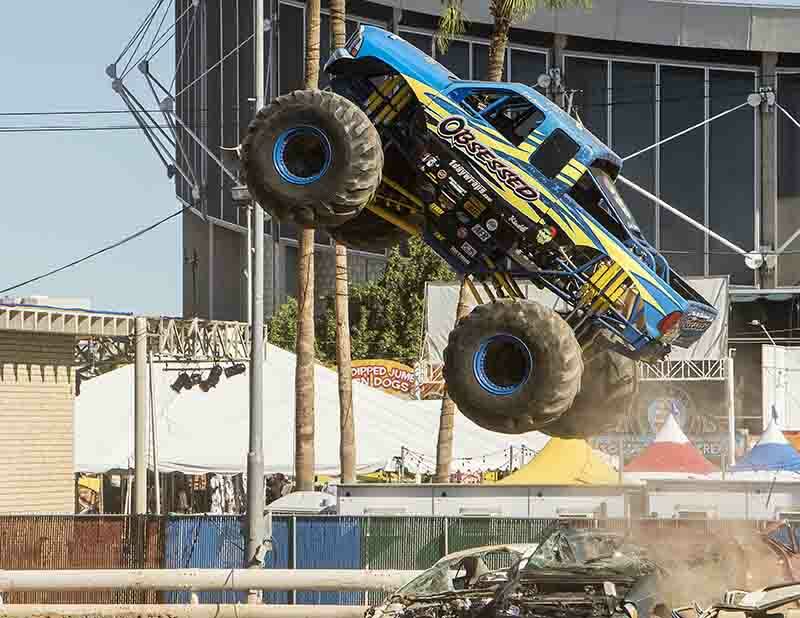 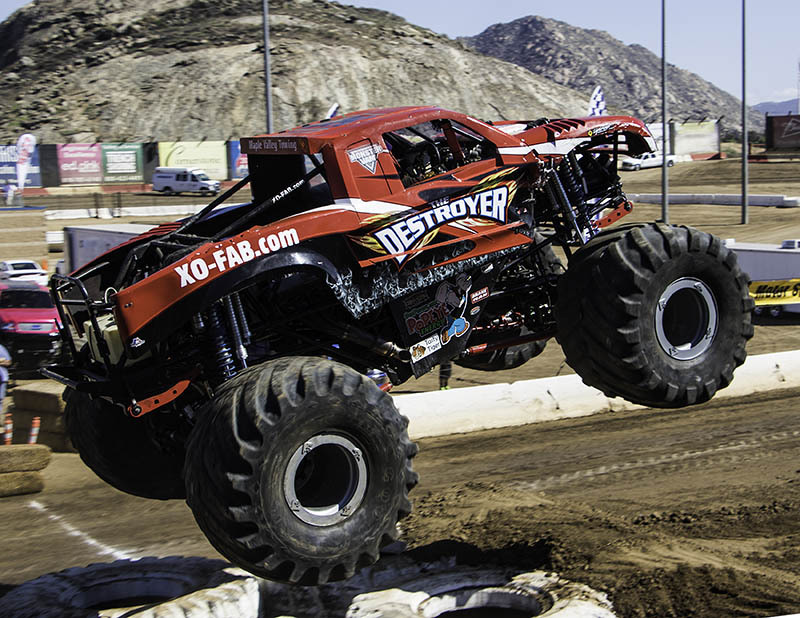 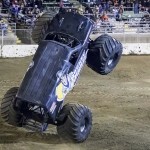 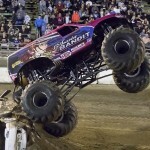 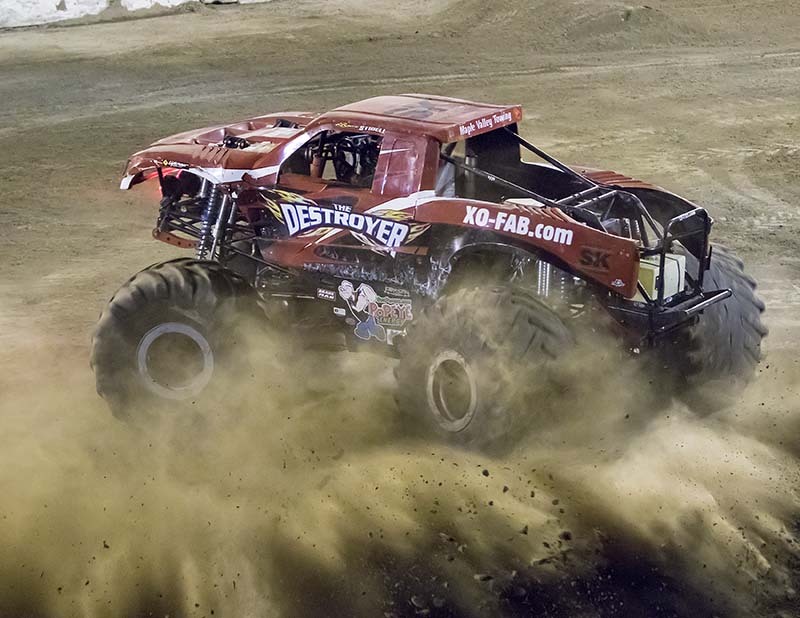 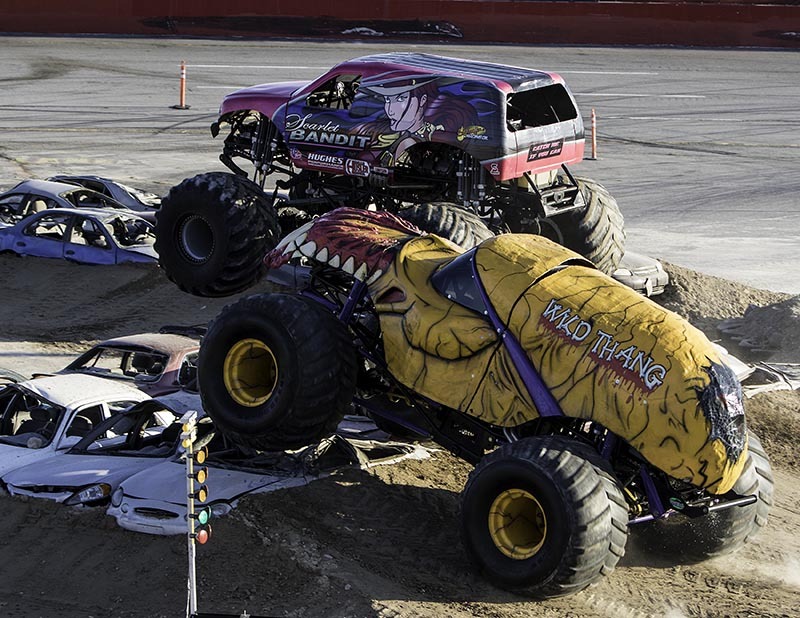 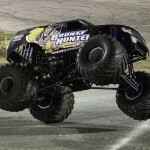 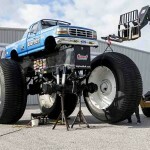 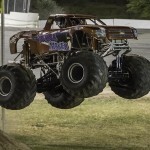 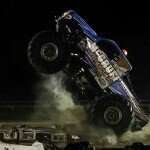 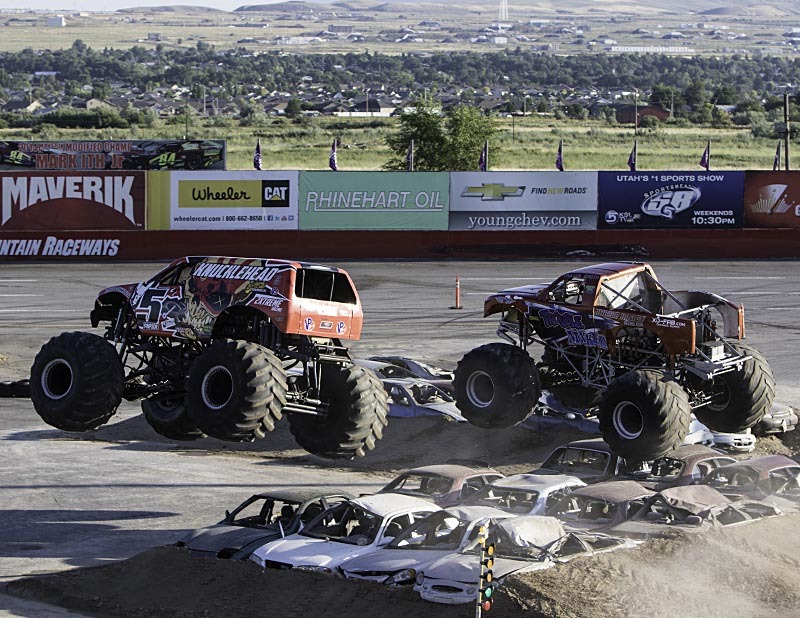 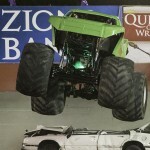 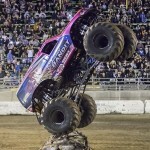 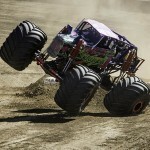 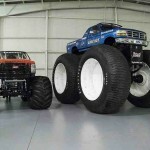 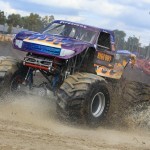 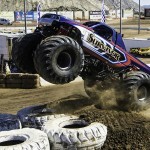 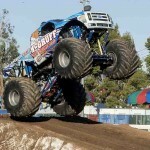 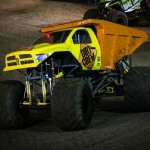 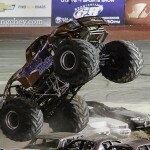 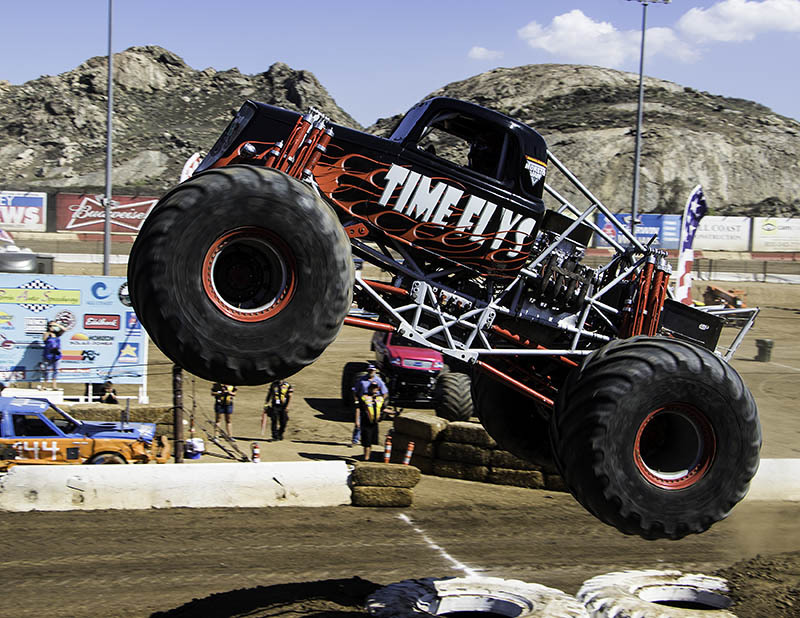 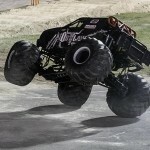 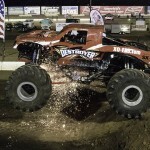 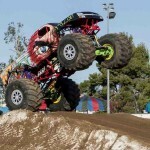 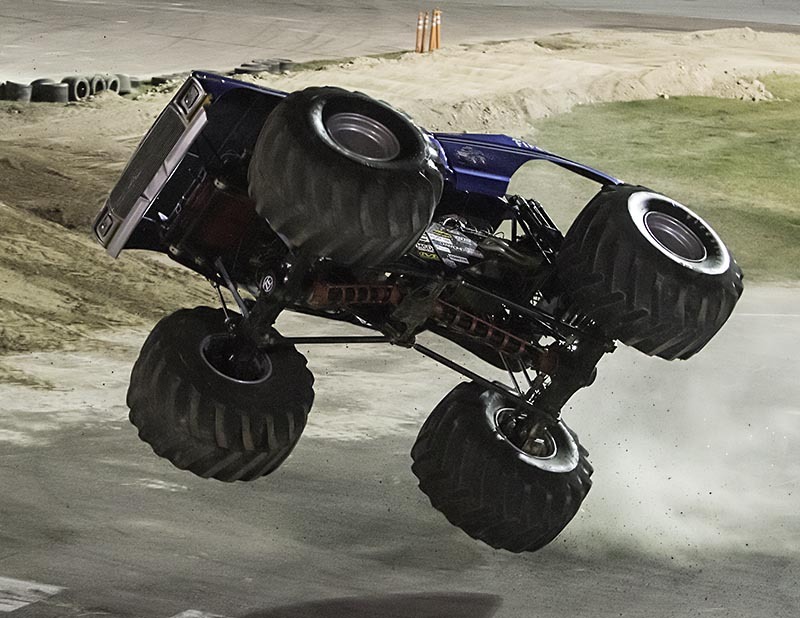 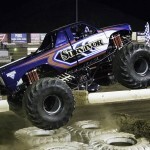 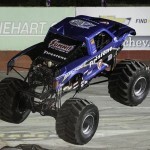 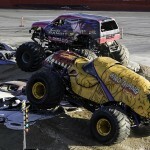 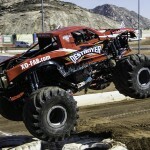 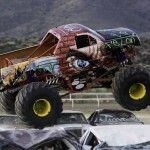 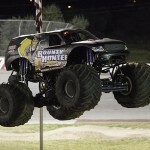 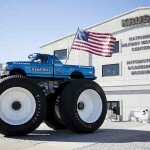 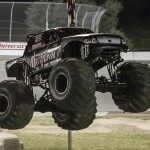 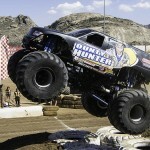 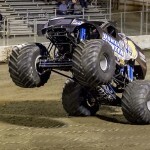 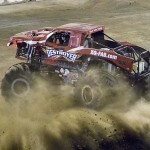 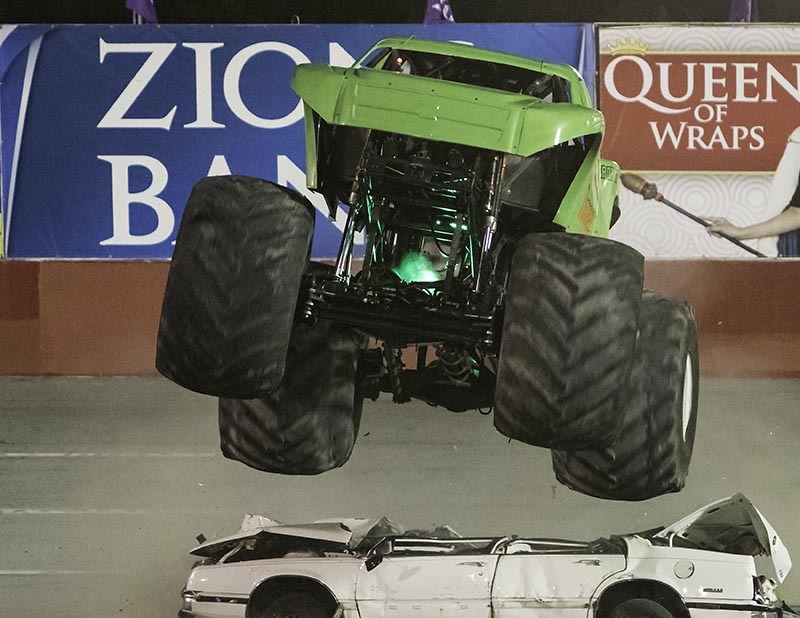 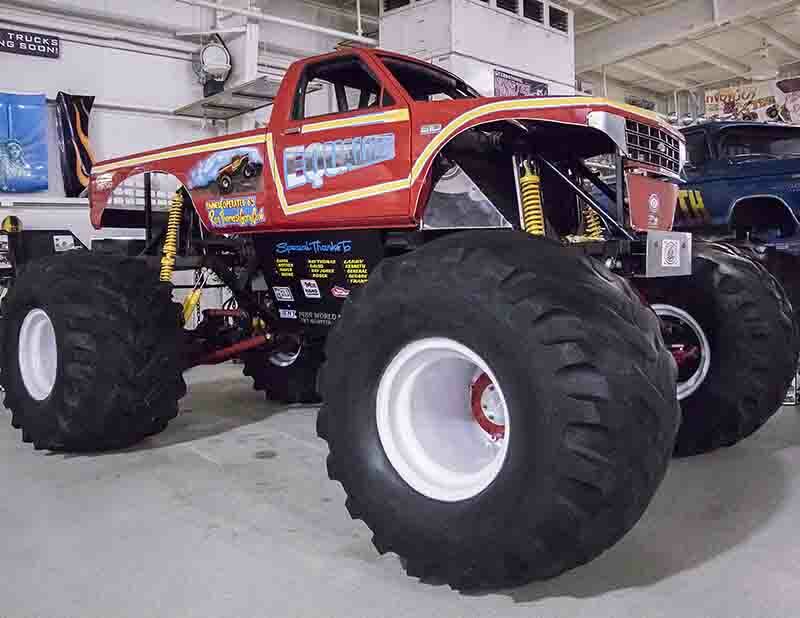 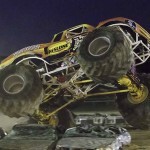 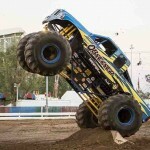 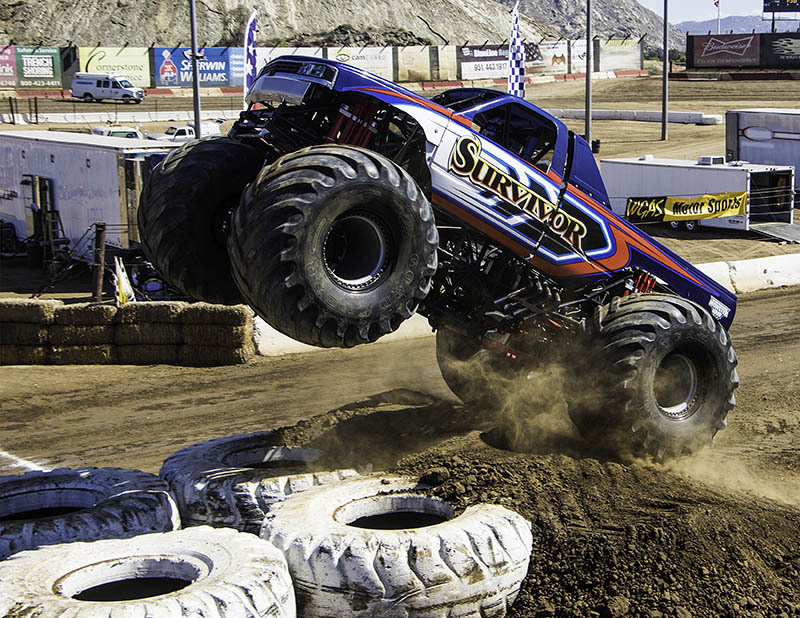 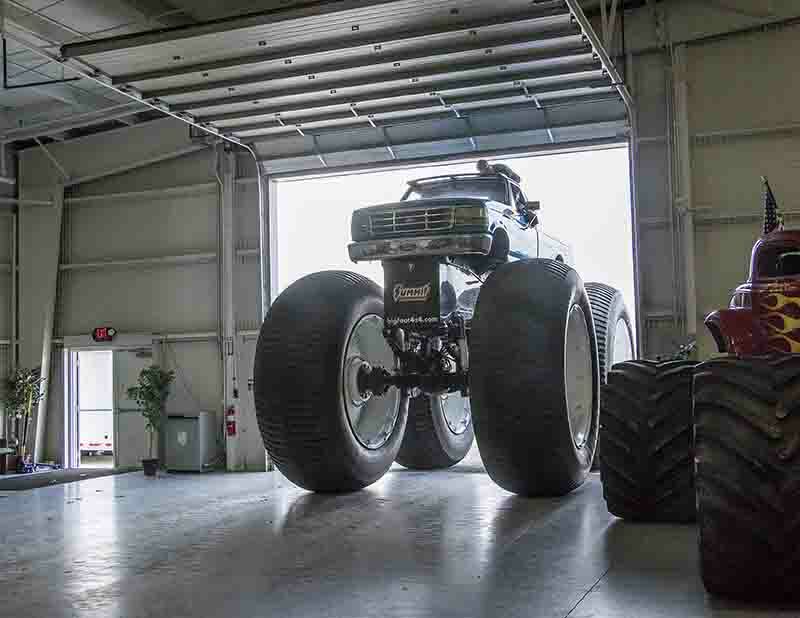 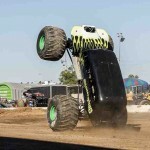 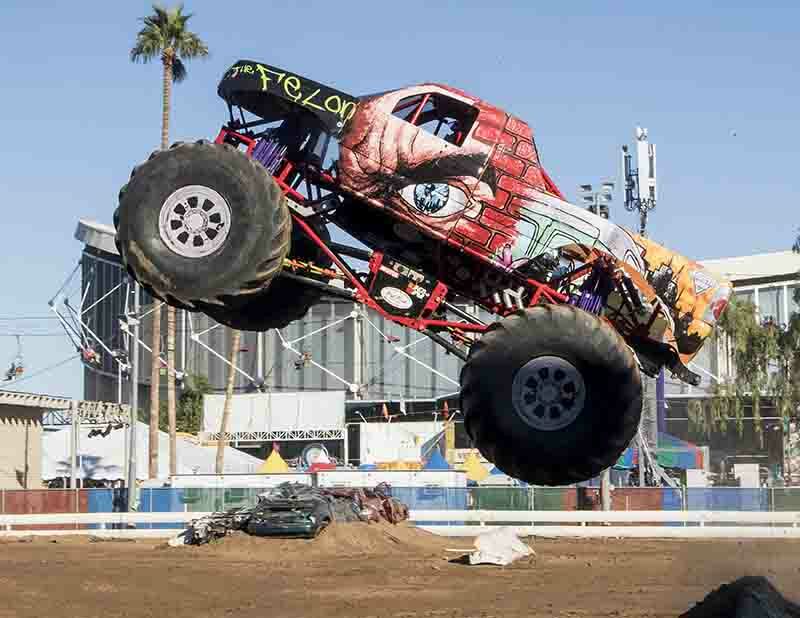 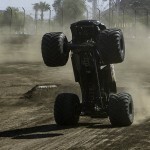 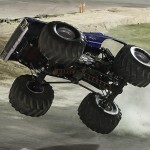 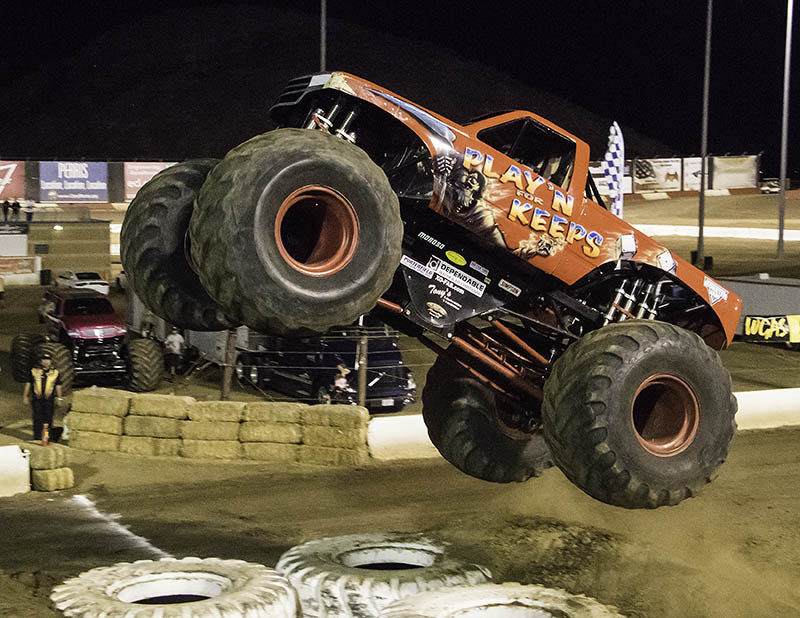 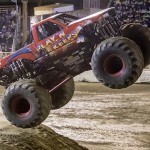 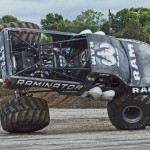 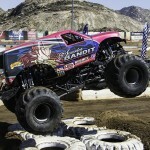 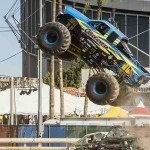 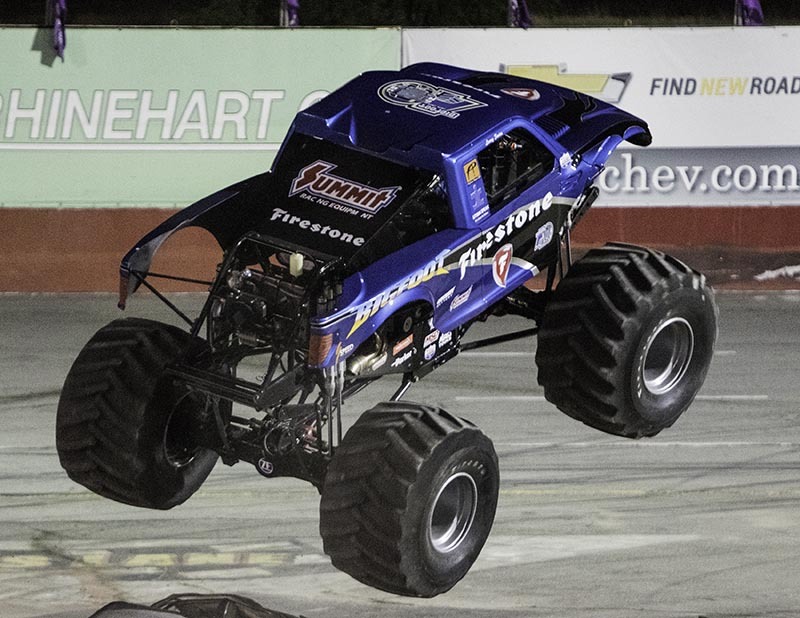 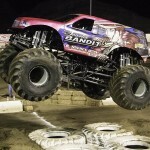 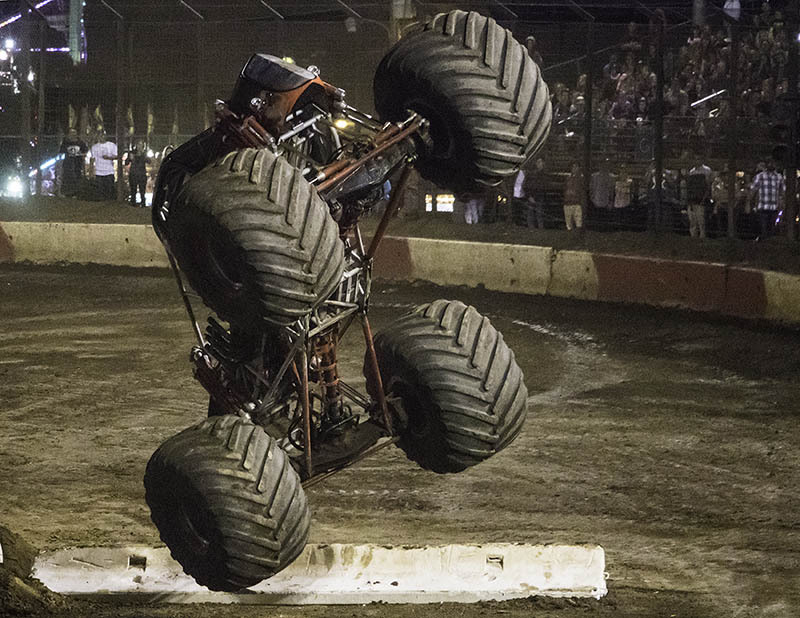 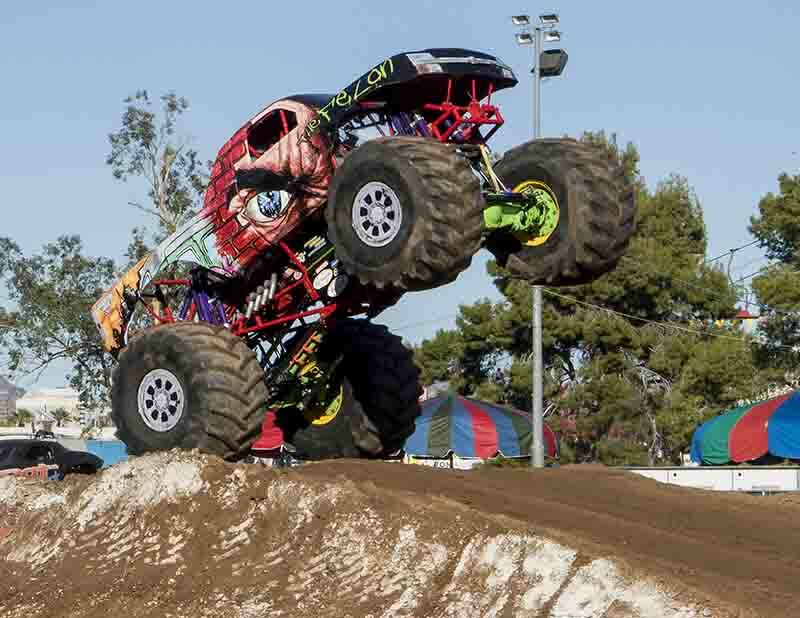 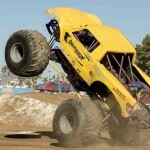 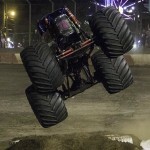 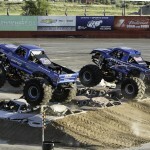 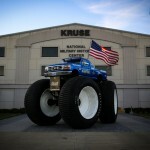 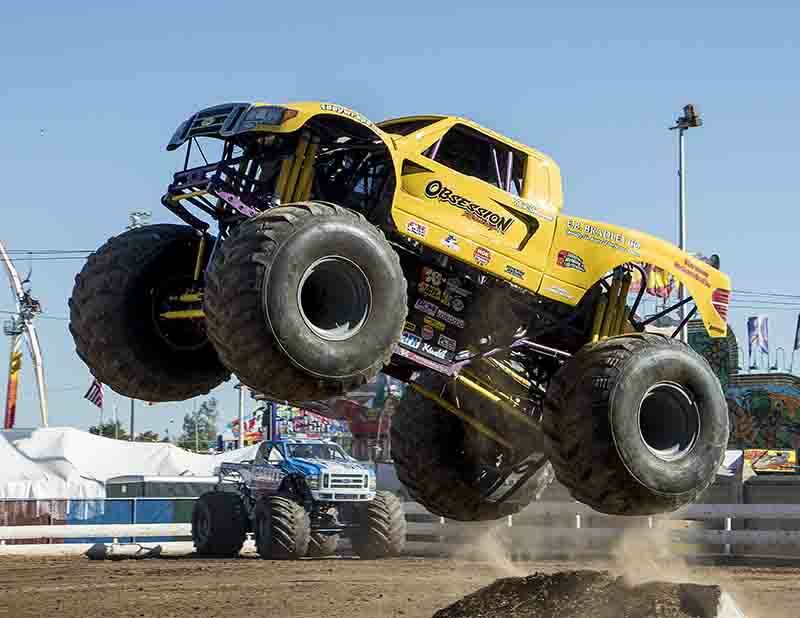 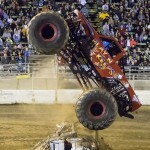 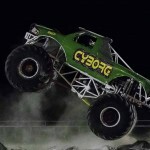 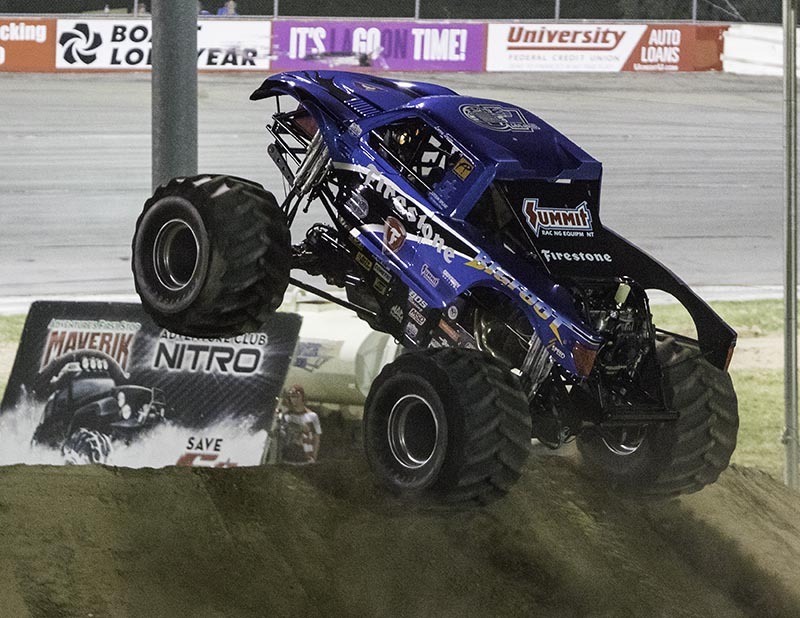 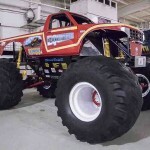 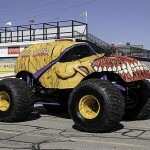 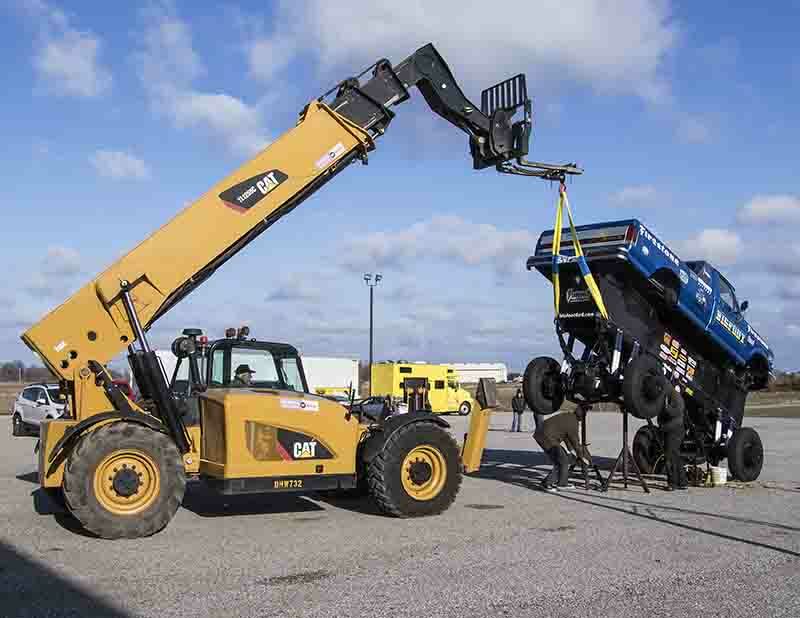 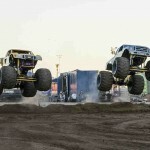 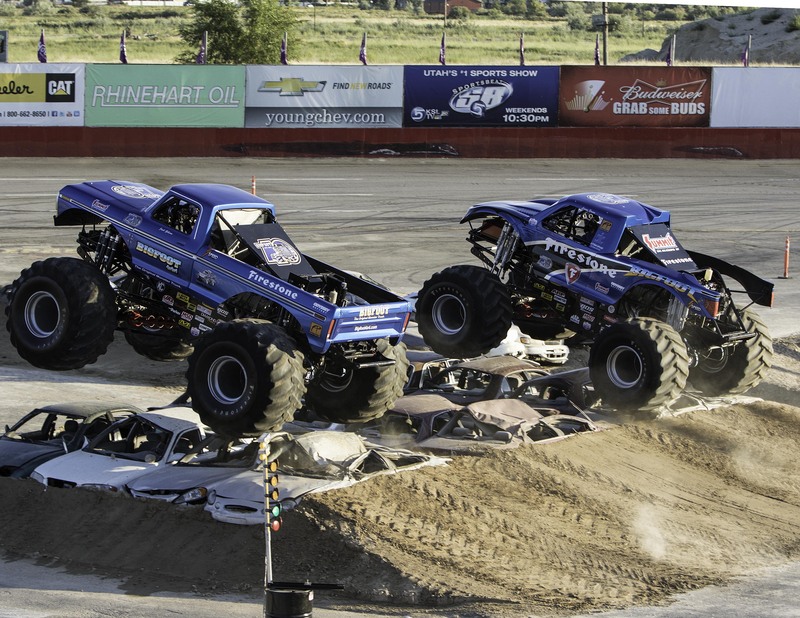 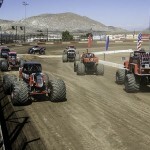 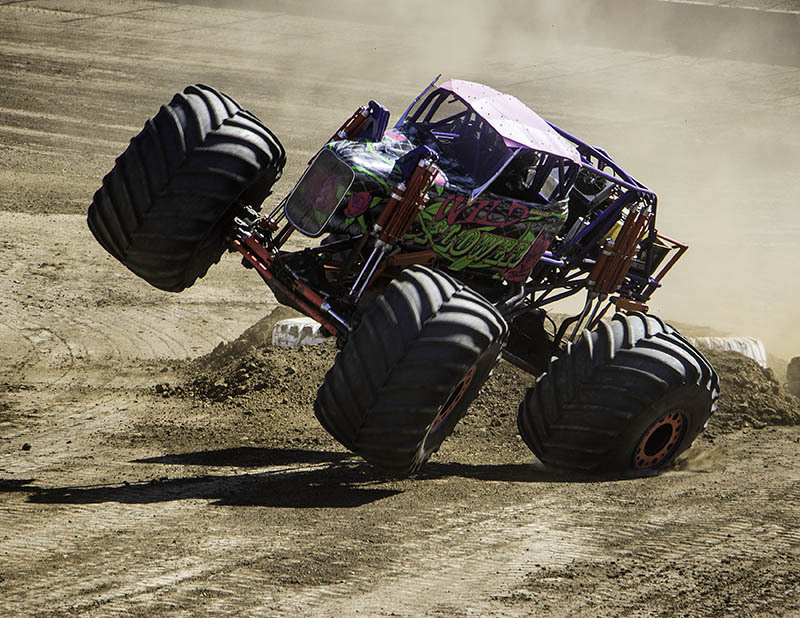 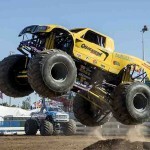 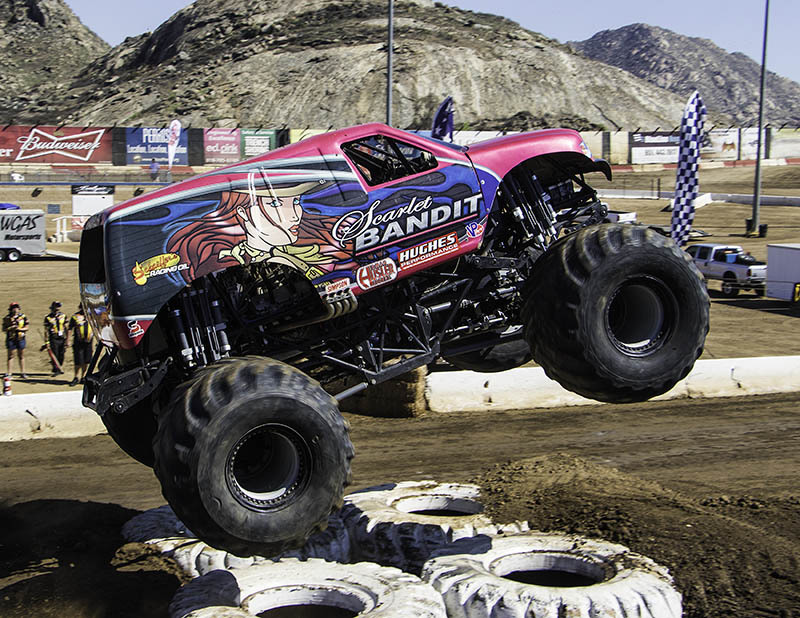 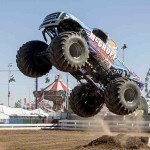 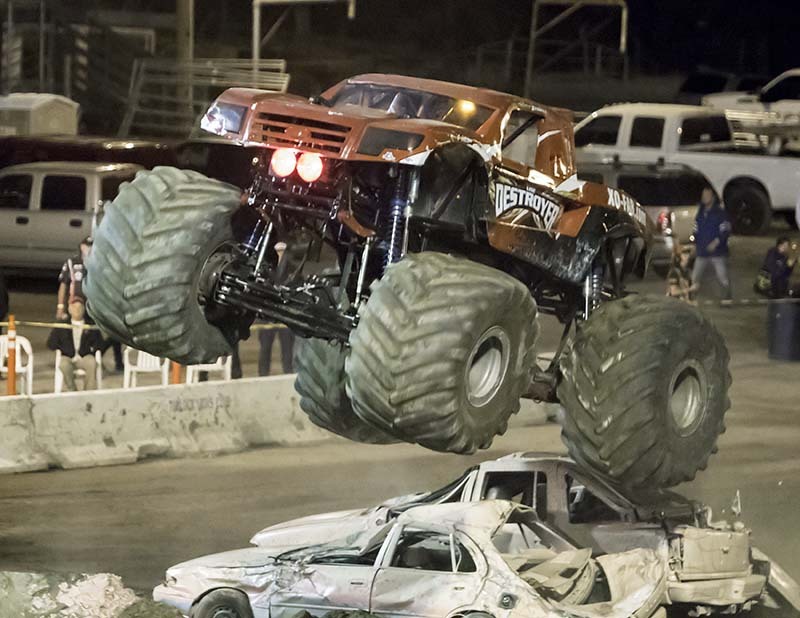 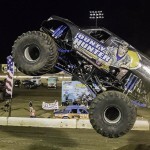 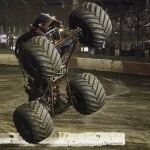 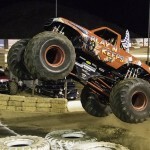 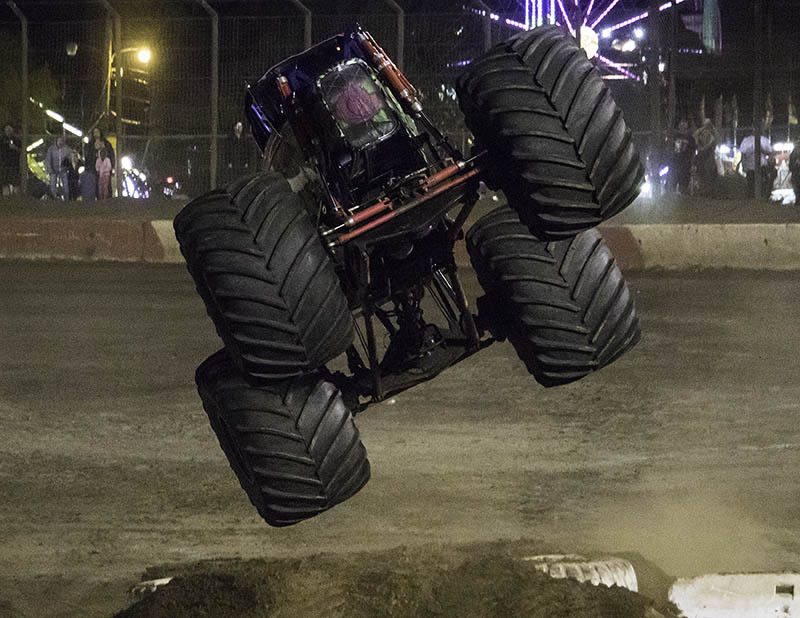 Six gear grinding, ground pounding monster trucks arrived to do battle in six shows throughout the weekend. 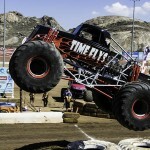 The shows consisted of wheelie contest and freestyle over Friday and Saturday before the High Jump and freestyle competitions on Sunday. 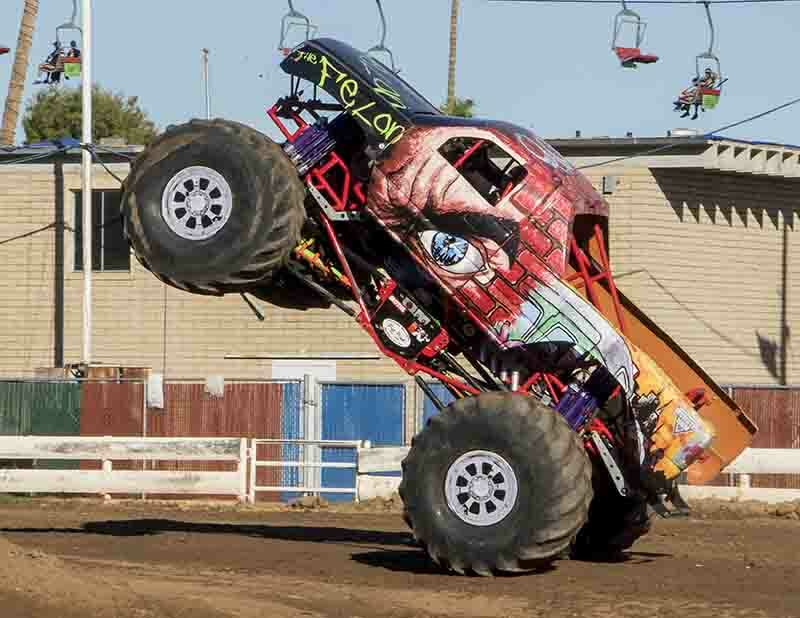 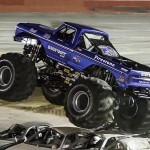 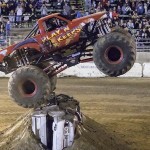 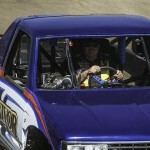 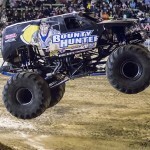 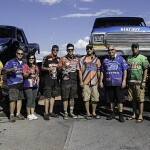 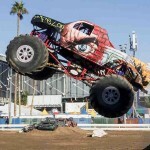 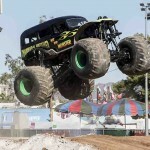 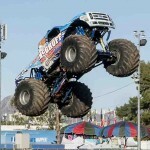 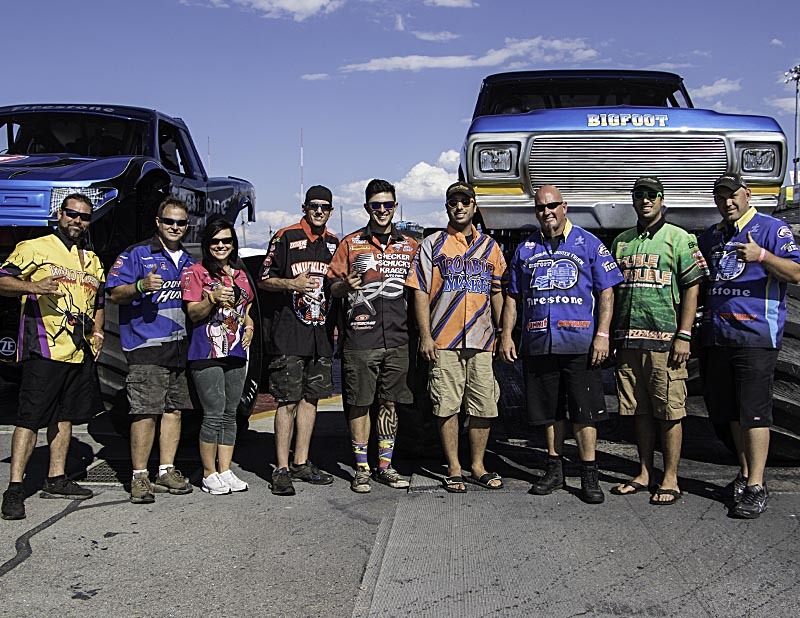 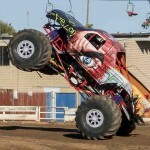 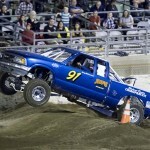 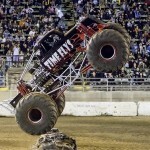 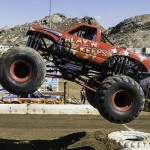 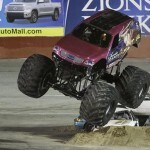 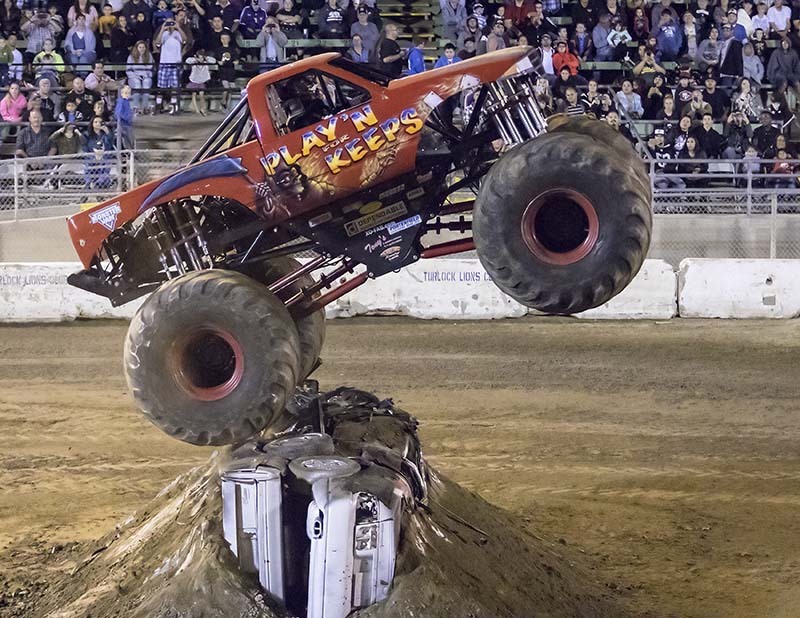 The shows featured Lake Havasu City, Arizona’s Mark Schroeder and his Felon truck. 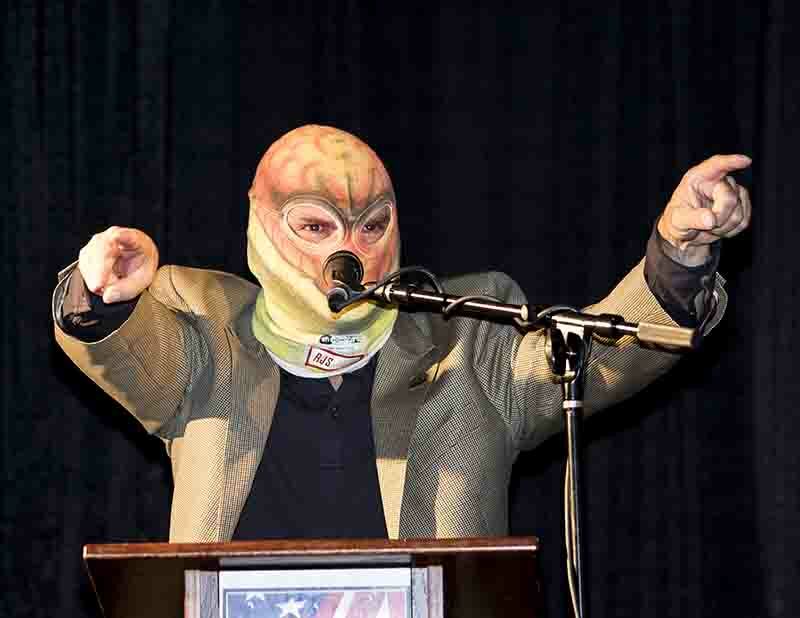 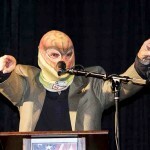 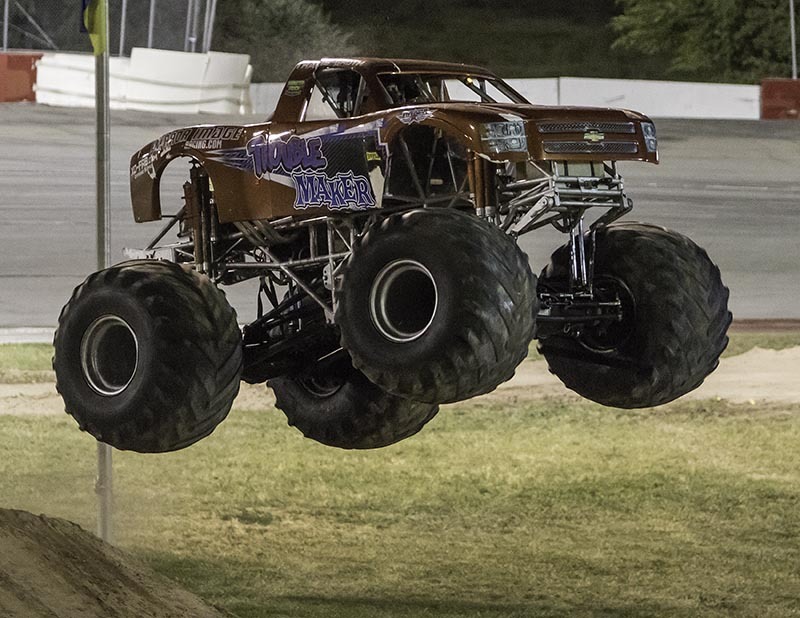 From just a few hours south of Phoenix was Rod Wood and his McGruff monster, ready to take a bite out of the competition. 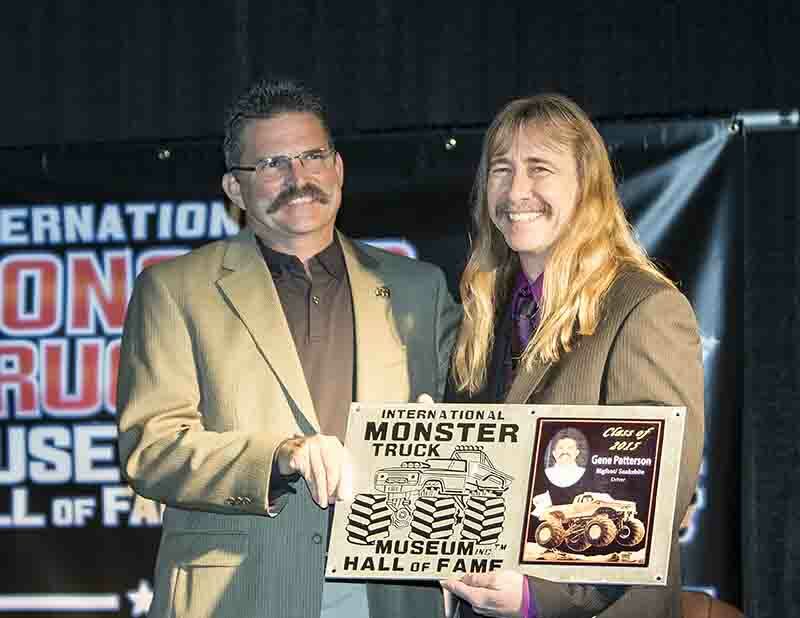 There also was Mexico’s Cesar Nunez driving the sleek 1963 split window Corvette Rat Attack. 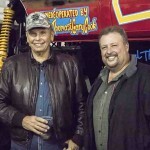 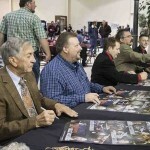 There also was the California based father and son team of Rick and Eric Swanson. 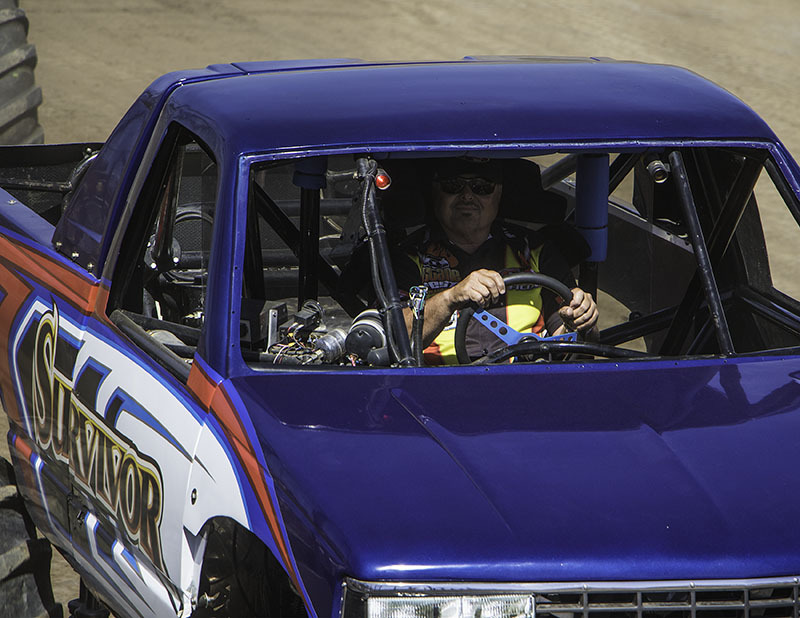 Rick, as usual, piloted his bright yellow trophy truck Obsession and twenty year old Eric took the helm of his blue pickup truck bodied Obsessed. 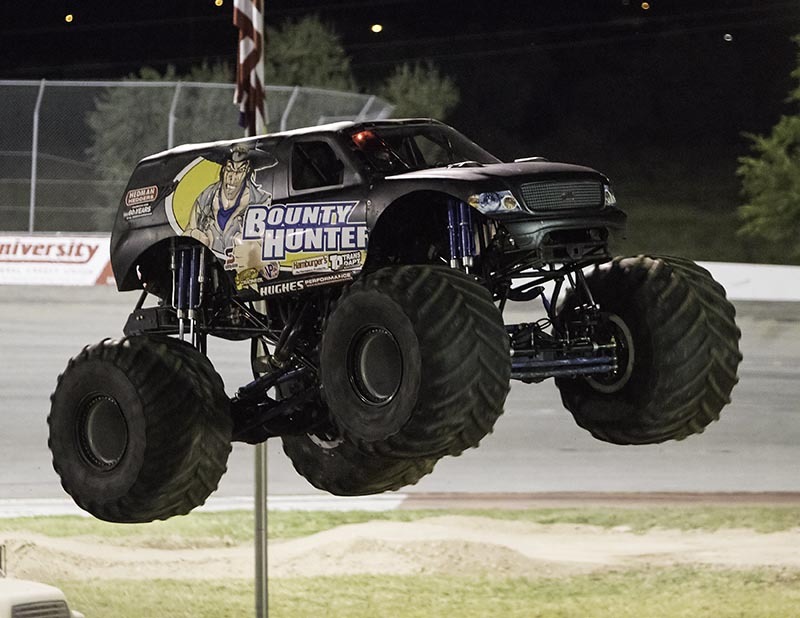 Rounding out the field was Tucson’s Sam Sturges in his 1942 Dodge Panel Wagon Unnamed & Untamed. 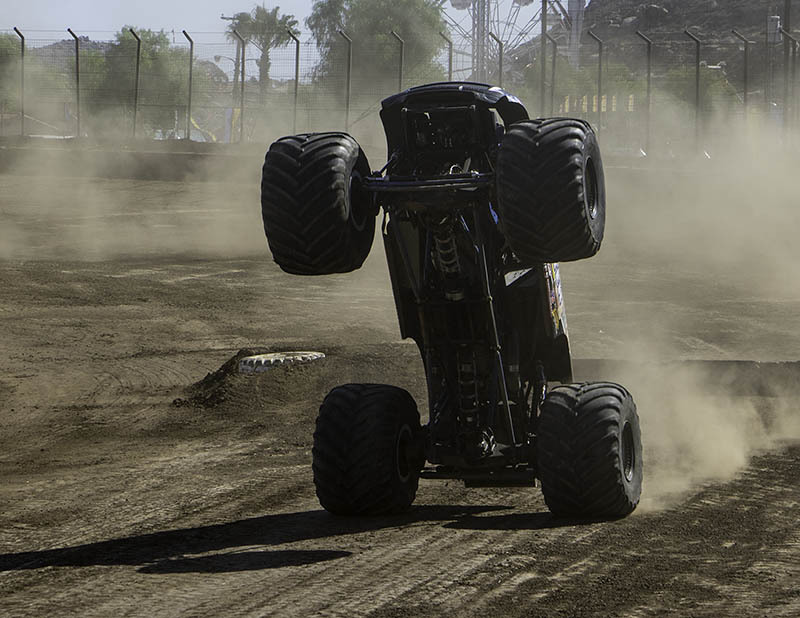 The heads-up competition only got hotter as the weekend went on. 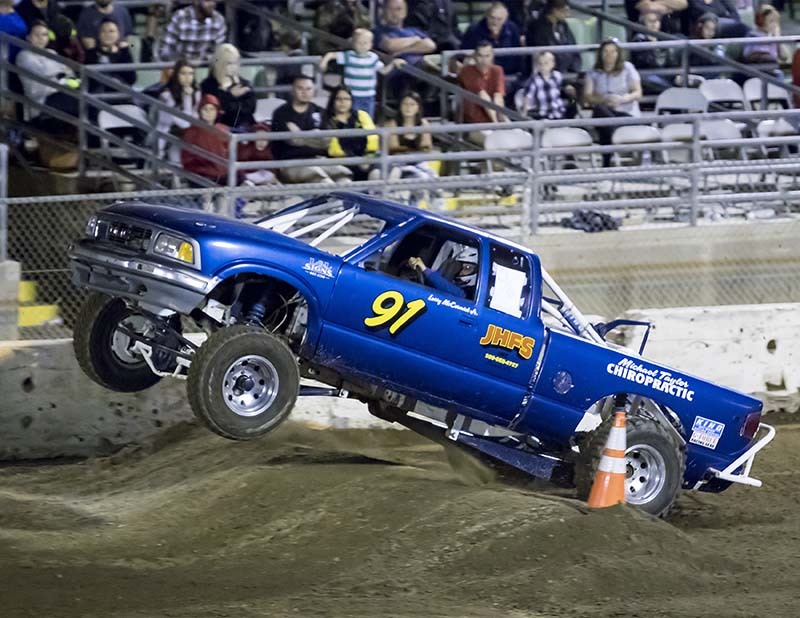 In wheelie contest on Friday evening, all trucks gave great efforts, each driver pushing his truck to the limit to get the best wheelie possible. 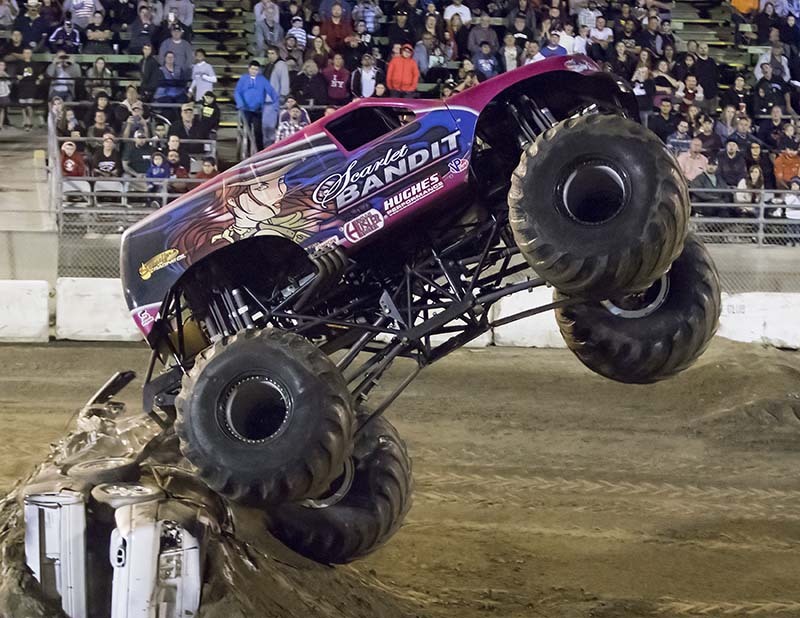 Things quickly boiled down to a showdown between McGruff and Rat Attack, both going vertical with regularity, often to good response from the huge crowd. 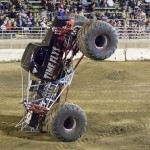 In freestyle, the two wheelie bumps, a set of crush cars and a huge center ramp were all fair game to win over the audience. 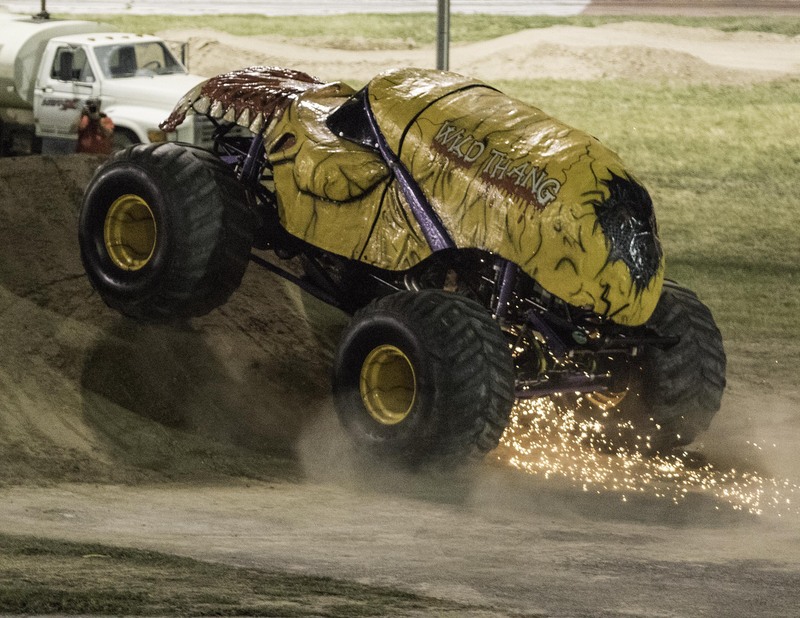 Both Rat Attack and McGruff got huge air over the center ramp while Felon worked his signature wheelies and did some cyclones that truly were dirt slinging to end the opening show on Friday. 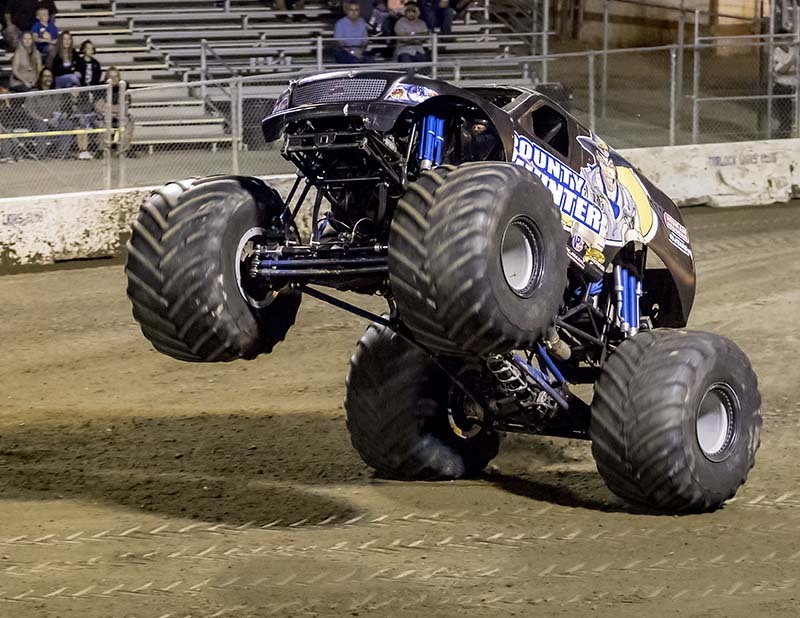 On Saturday, the veteran Sam Sturges and Unnamed & Untamed got off to a fast start in the wheelie contest, going straight up and down to push way ahead of father and son Swanson. 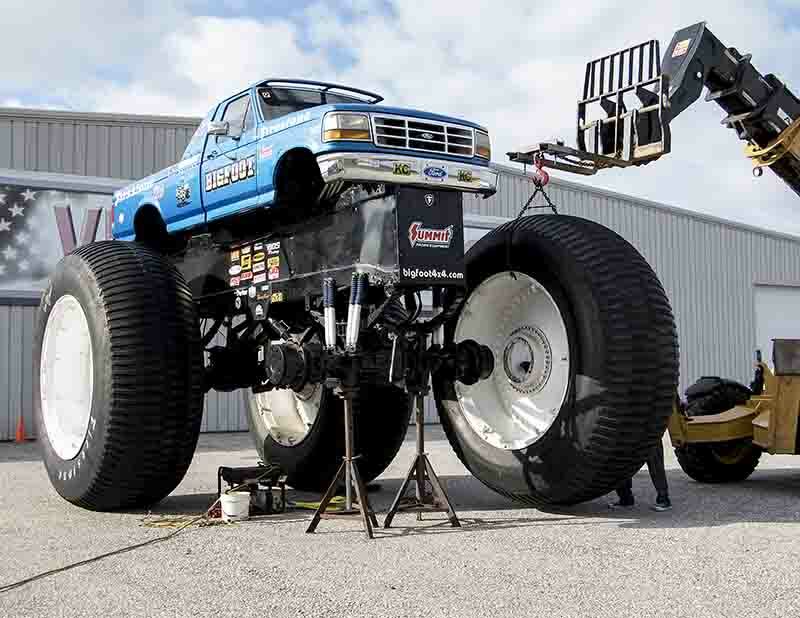 But in doing so, Unnamed broke an axle. 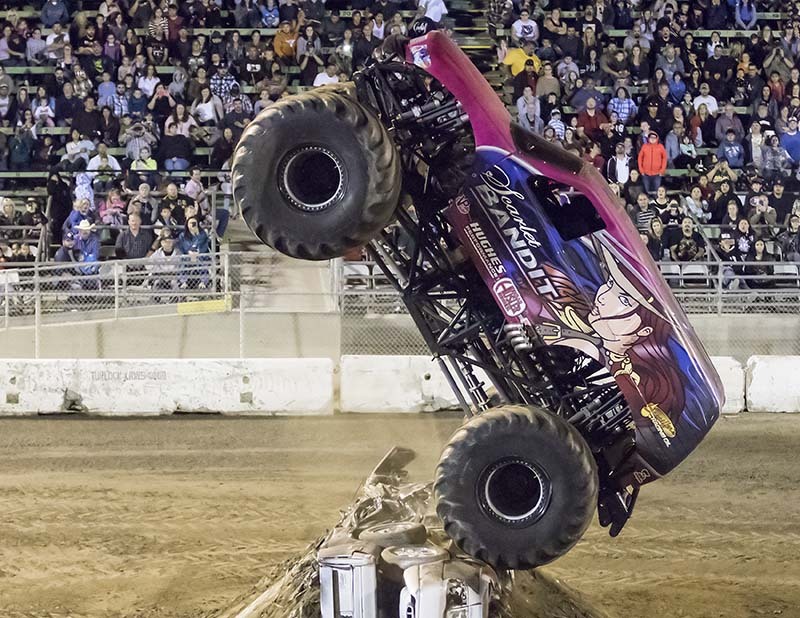 The California team caught up quickly in freestyle, however, as both Rick and Eric smashed the crush cars and soared over the arena floor thanks to the big ramp in the middle, plus some great cross thread moves, all attempting to win over the fans. 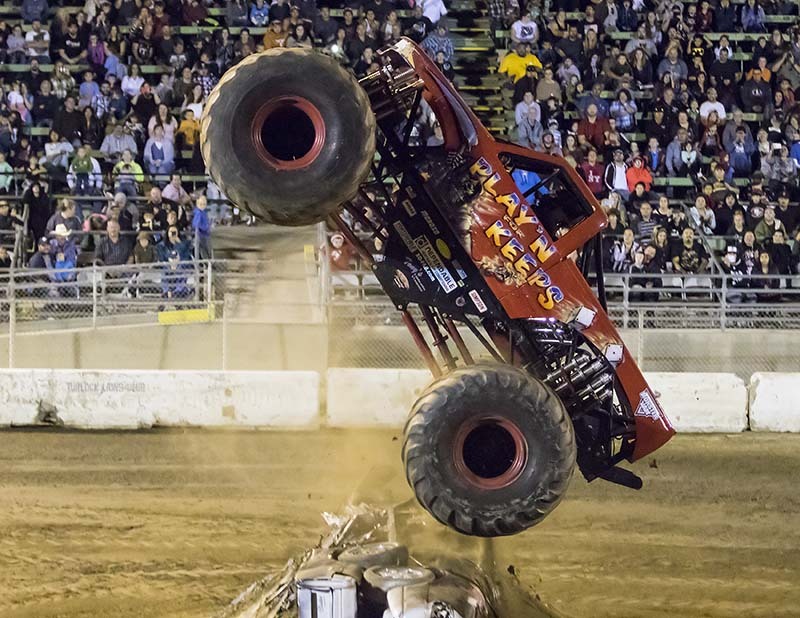 Because of Sam Sturges’ breakage, Cesar Nunez in Rat Attack stepped up to take his place. 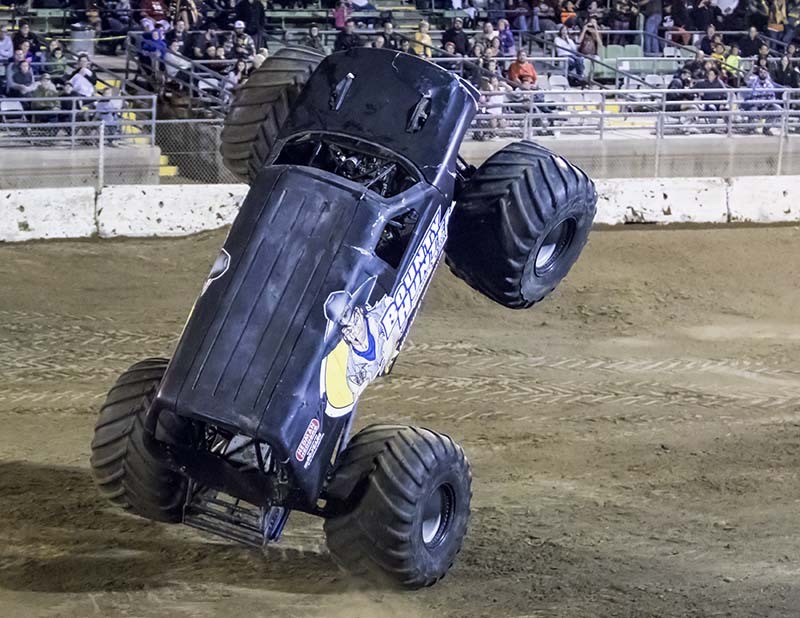 Not resting on his laurels from the first two shows, the corvette monster had an excellent power wheelie while the Obsession trucks struggled to do the same. 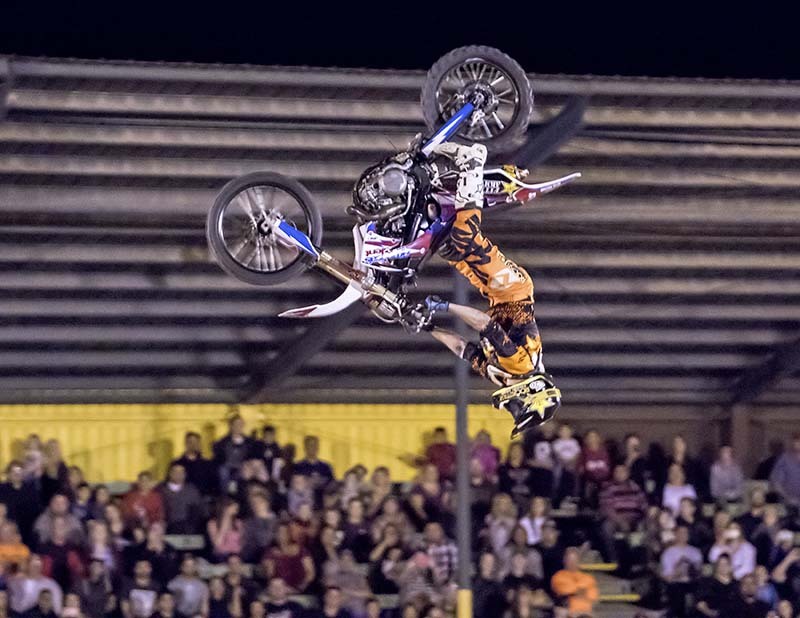 But when it came to freestyle, Rick and Eric did not back down, getting increasingly big air into the night sky and crushing the cars multiple times to thunderous applause from the capacity crowd. 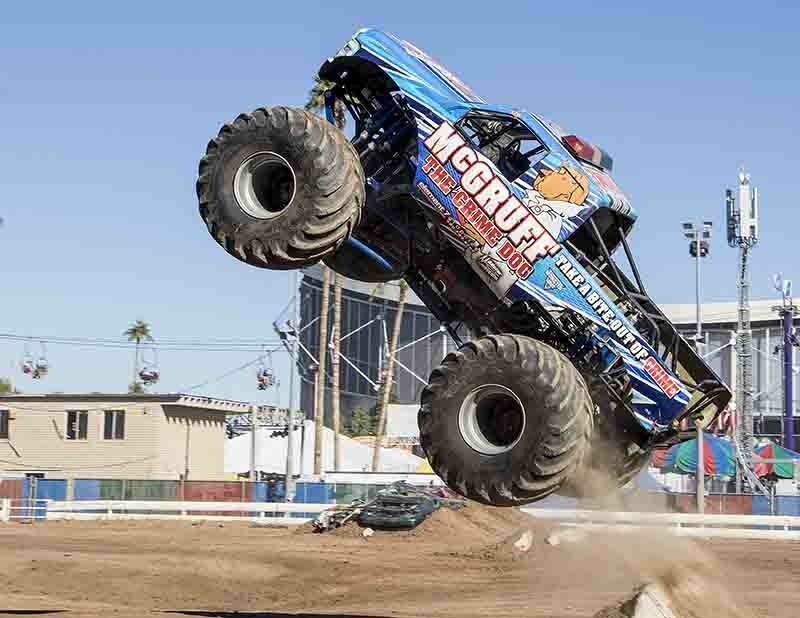 In the third show of the weekend midway through Saturday, McGruff was in a class all his own, breaking away from the competition. 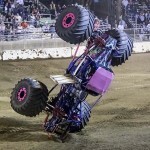 He did so with a great forty-five degree angle wheelie and changing things up with a terrific sky wheelie off the crush cars. 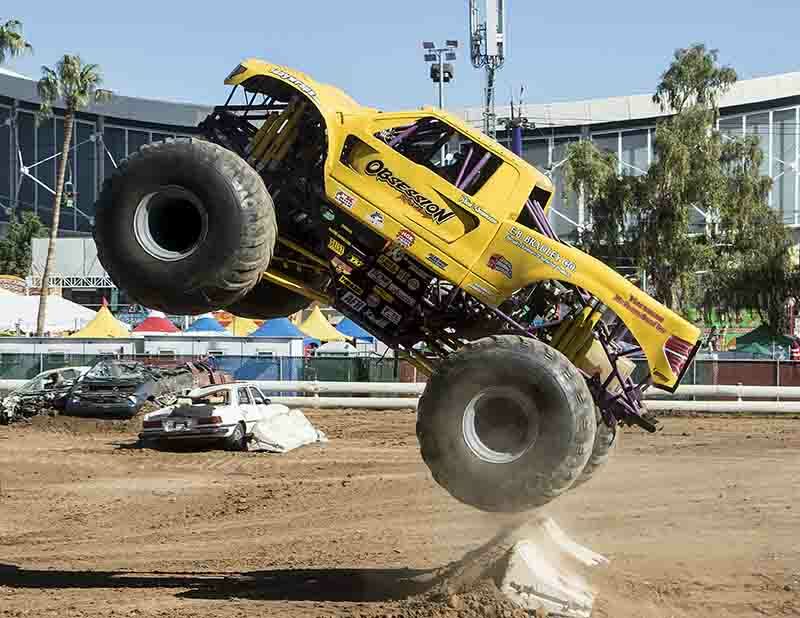 And the fans ate it up. 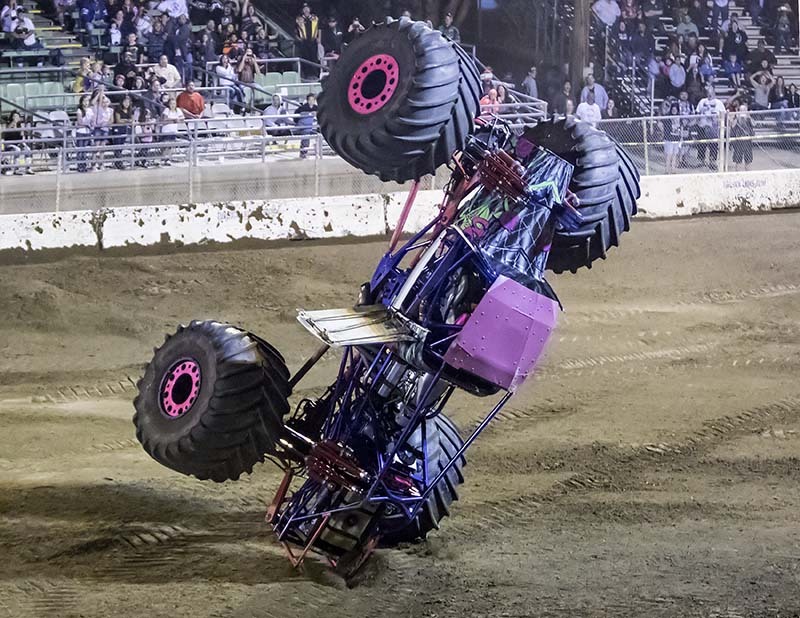 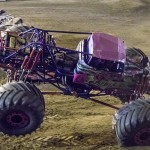 In freestyle, the end of Felon’s weekend came a little premature when the motor broke and the damage was not repairable. 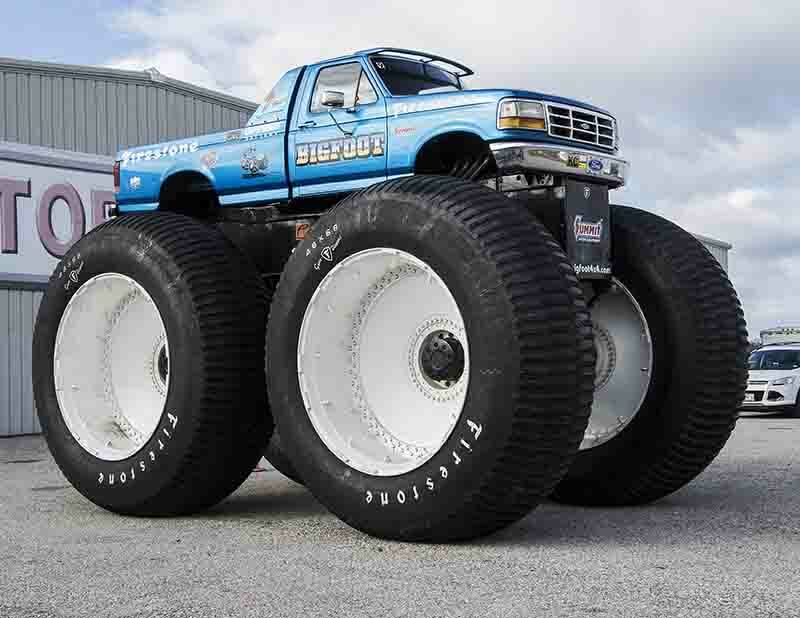 This left a shootout between Rat Attack and McGruff. 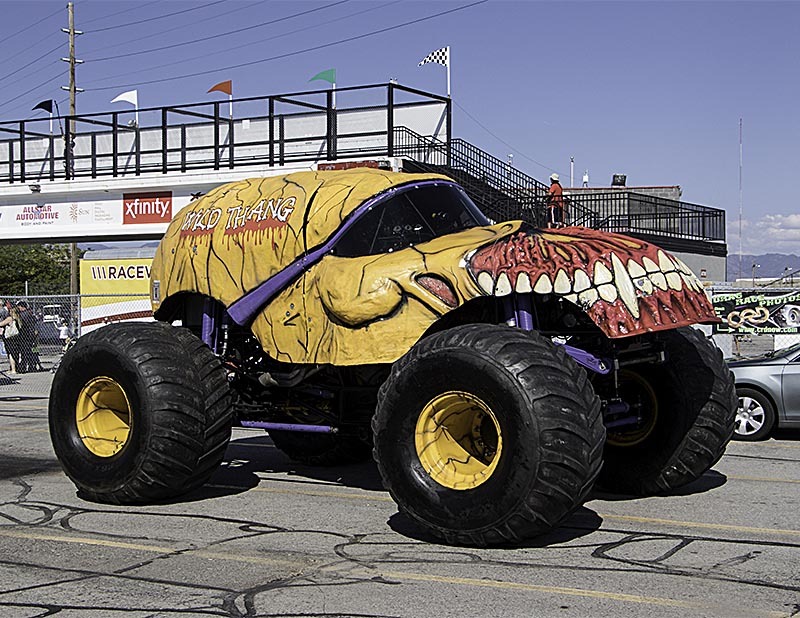 But ignition problems plagued Rat Attack from the very start, giving the best run to the Tucson native behind the wheel of McGruff. 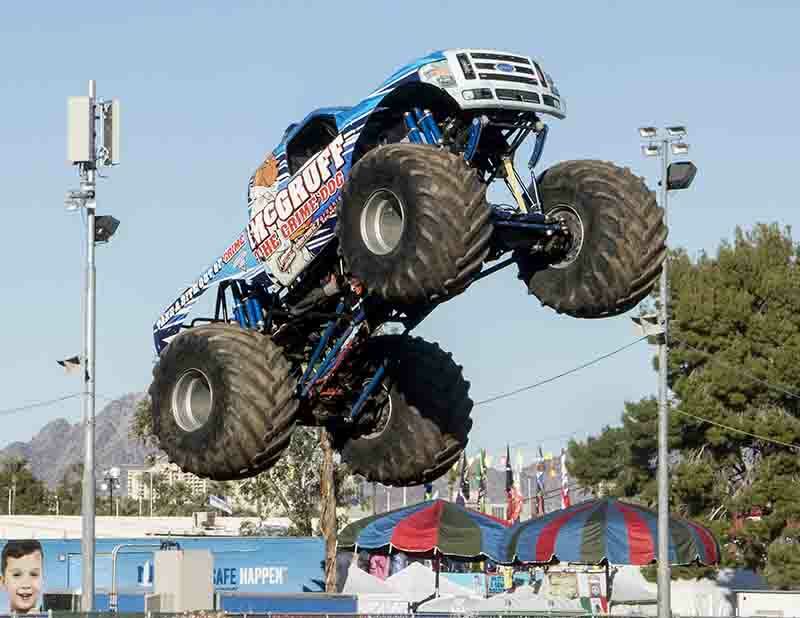 On the final day of the fair, show organizers changed things up for the crowd by having McGruff take the place of Obsessed. 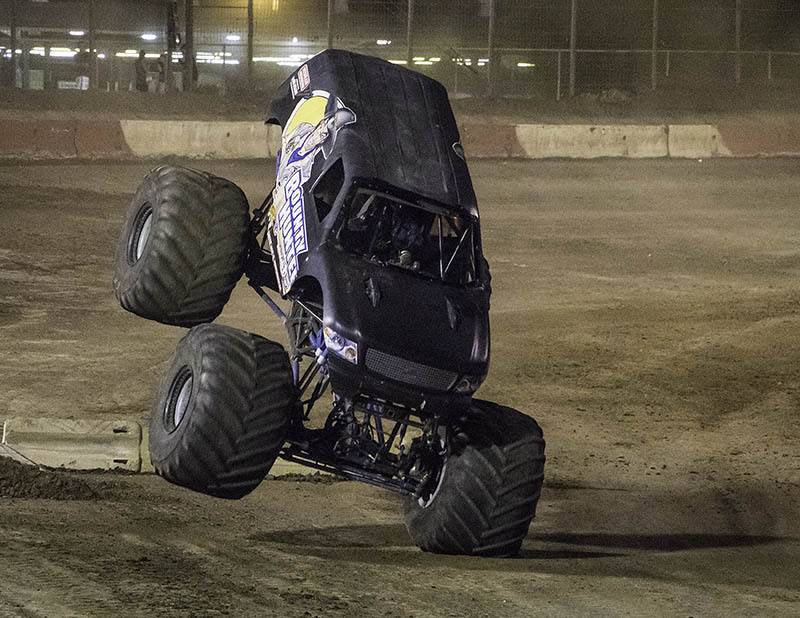 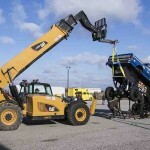 This led to a battle in wheelie contest for the ages. 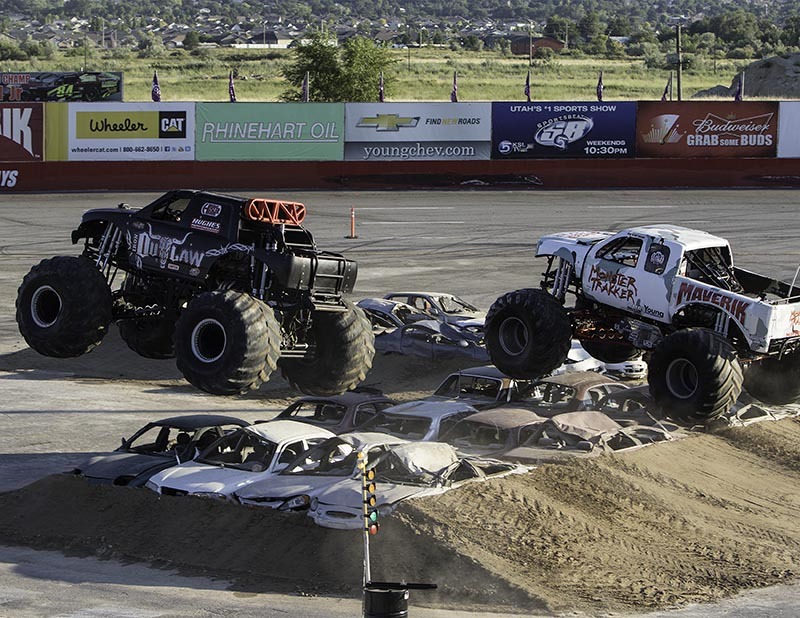 Both the Tucson representatives in McGruff and Unnamed & Untamed stood straight up and down with no clear winner between the two. 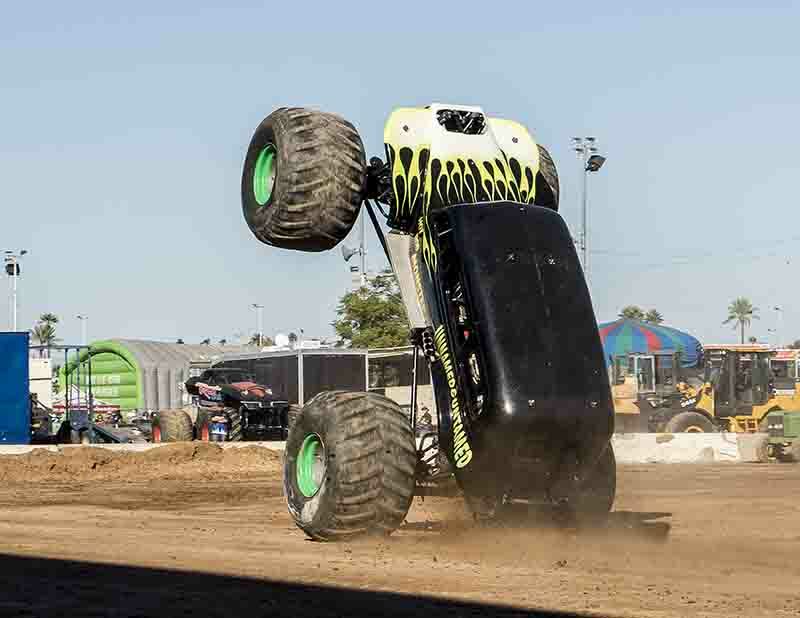 In the final show of the weekend, the High Jump competition had the crowd cheering on and the drivers continued to push their machines. 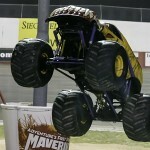 Each monster got two jumps each to outperform the others. 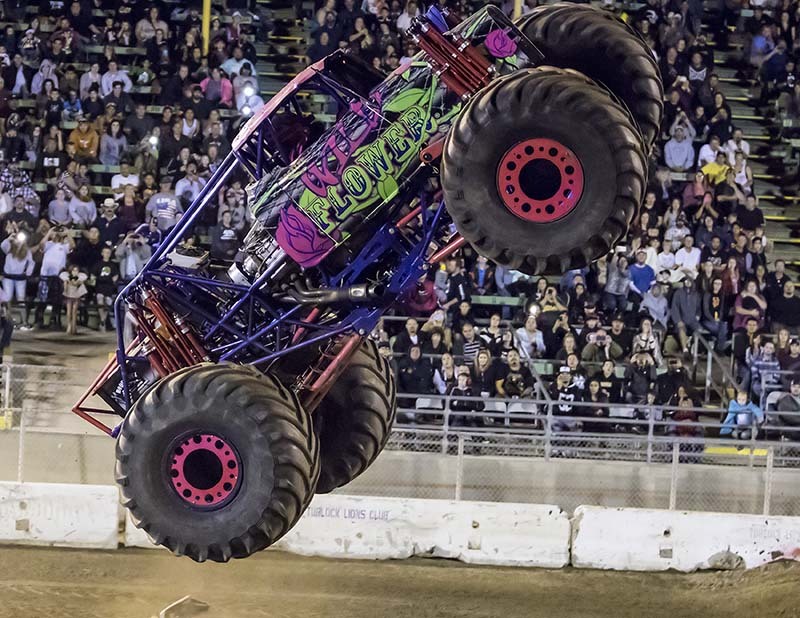 No official winner was announced to the enormous number of spectators in the stands, but Obsessed and Rat Attack clearly went the highest of all. 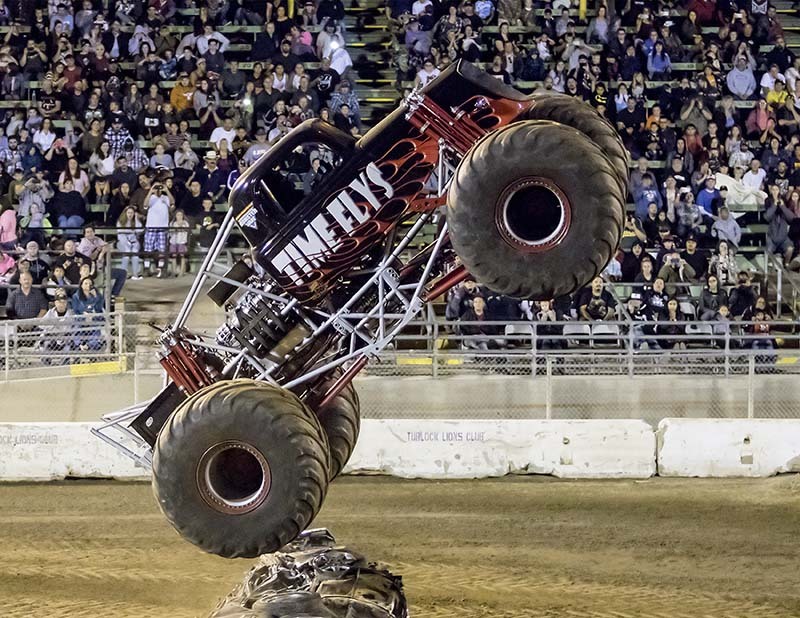 In the fair closing freestyle, both Rat Attack and Unnamed & Untamed went for broke with superb slap wheelies, but McGruff put together an exciting run that had the fans cheering practically from start to finish by smashing the crush cars, and great sky wheelies to wrap things up for the monsters at the fair for 2015. 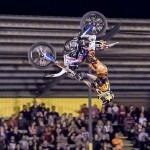 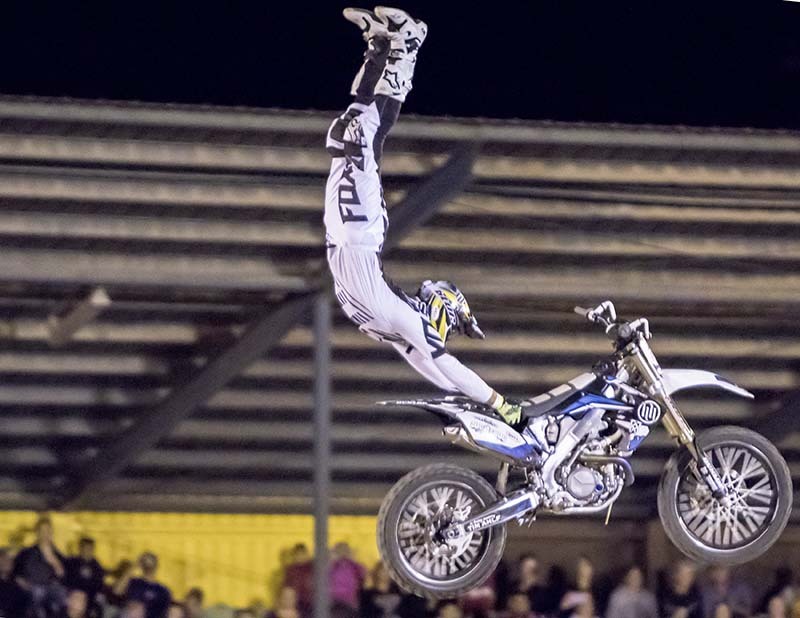 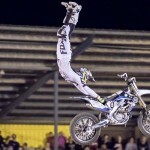 In other action, four daredevil freestyle motocross riders including a member of the famous Metal Mulisha wowed both the young and young at heart alike with spectacular tricks high above the arena floor. 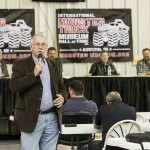 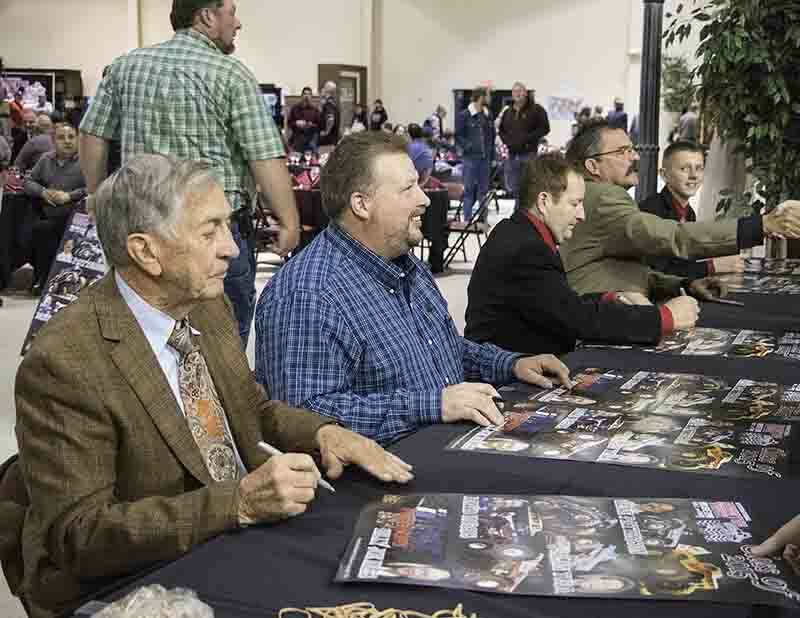 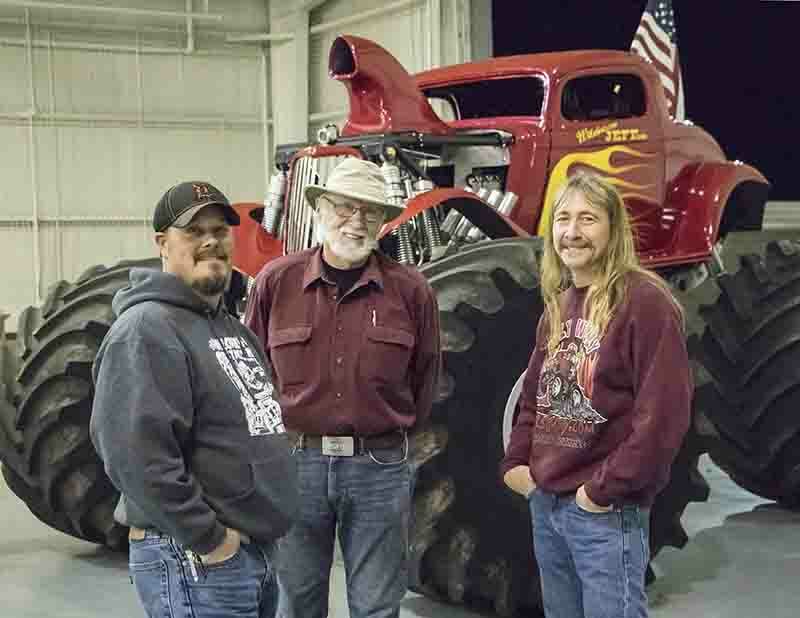 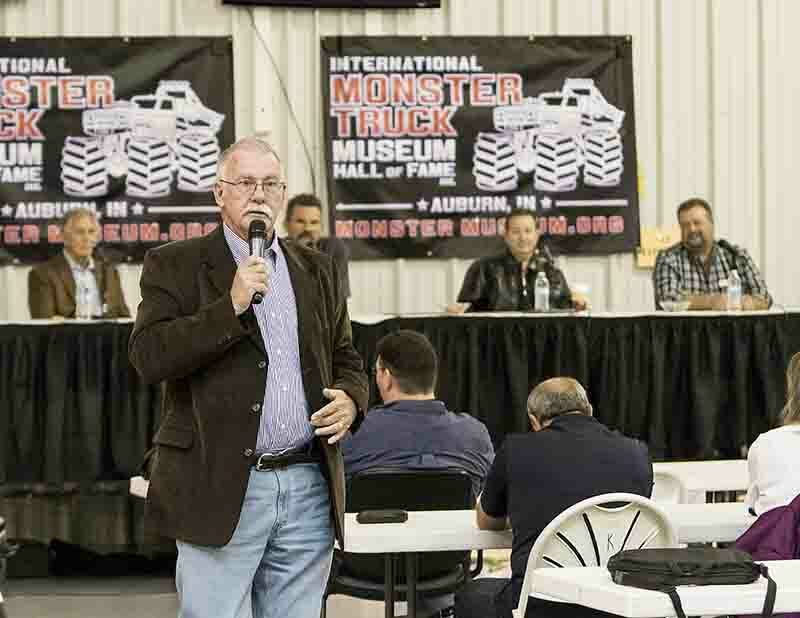 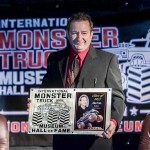 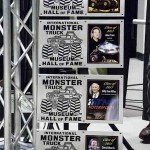 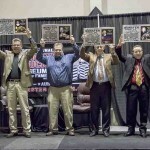 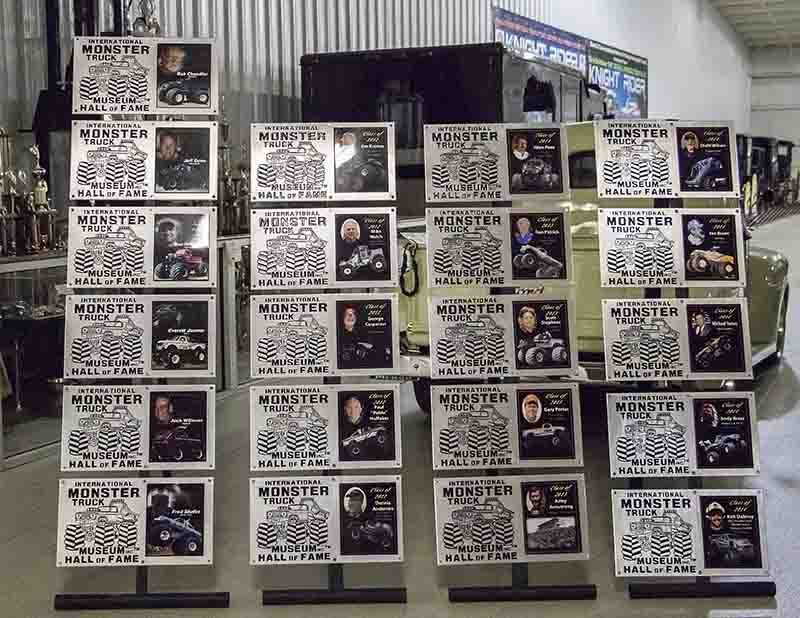 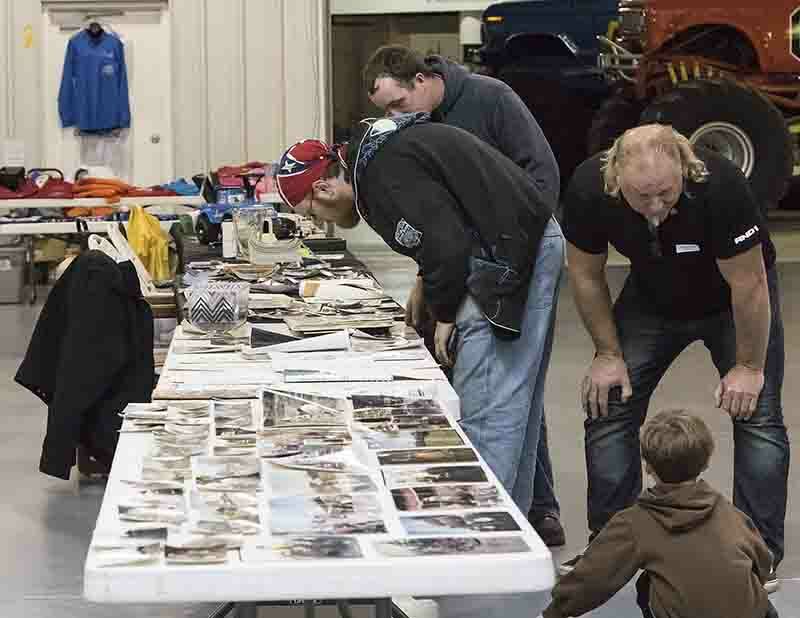 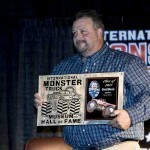 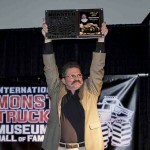 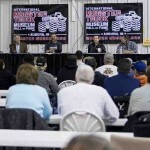 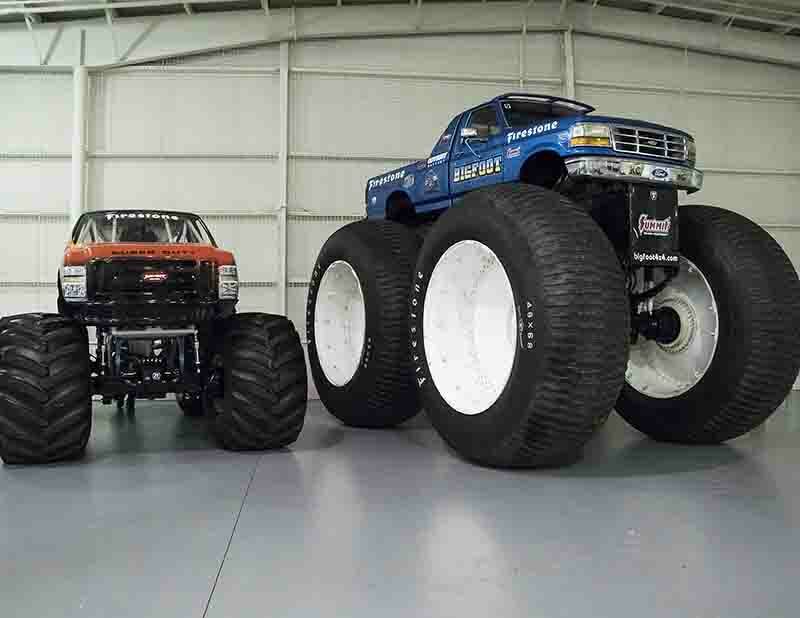 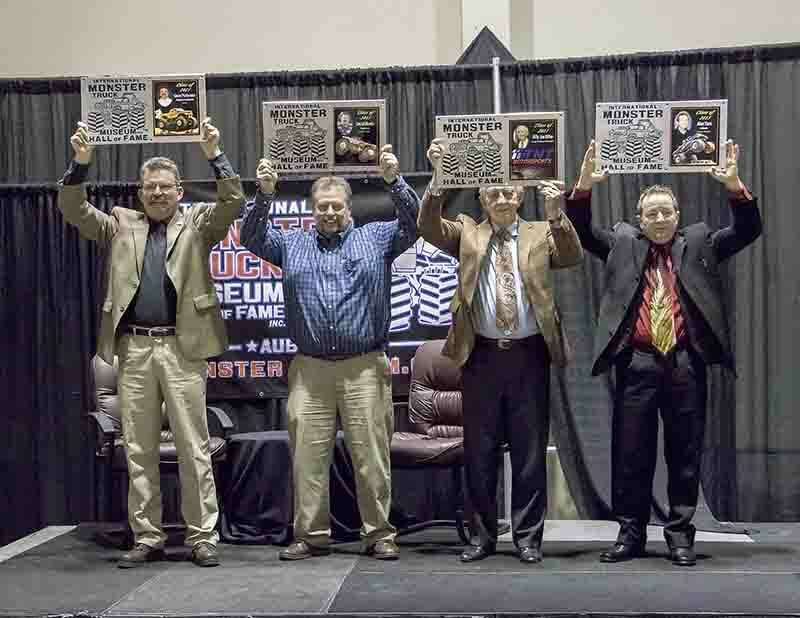 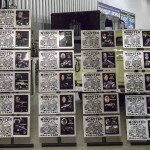 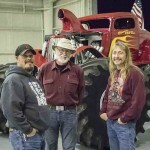 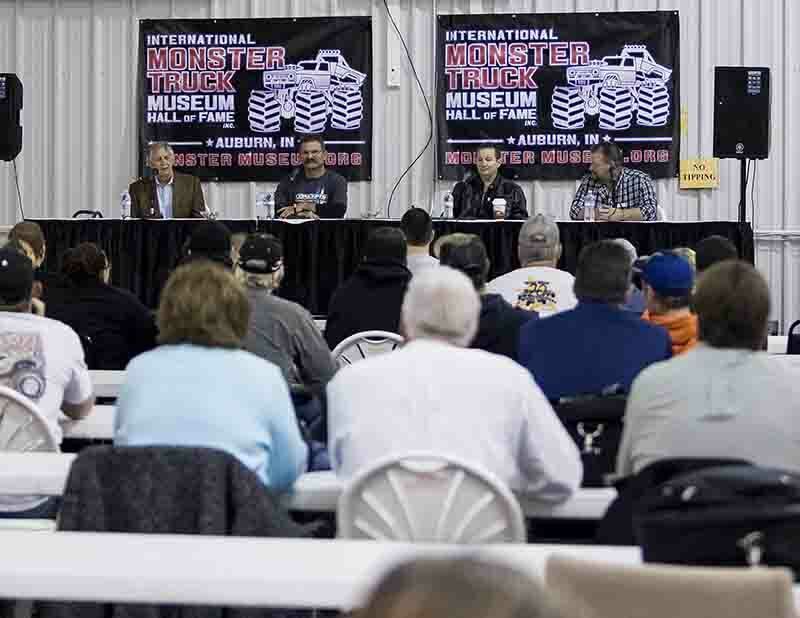 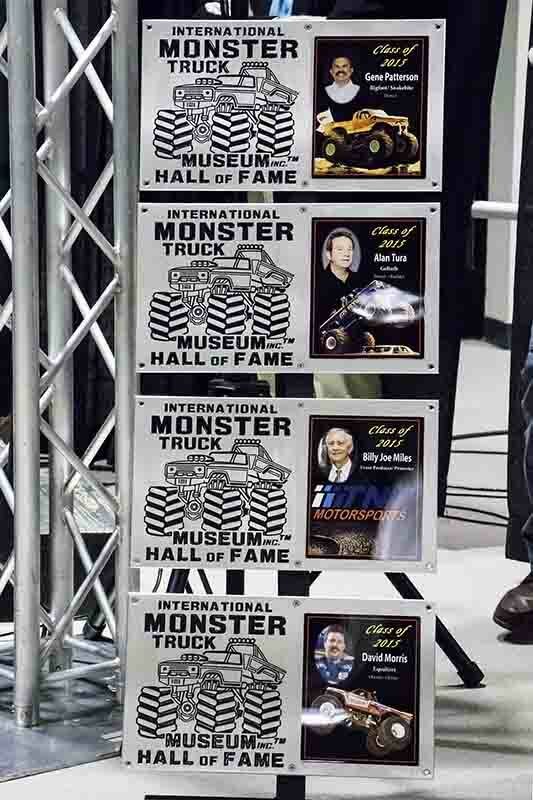 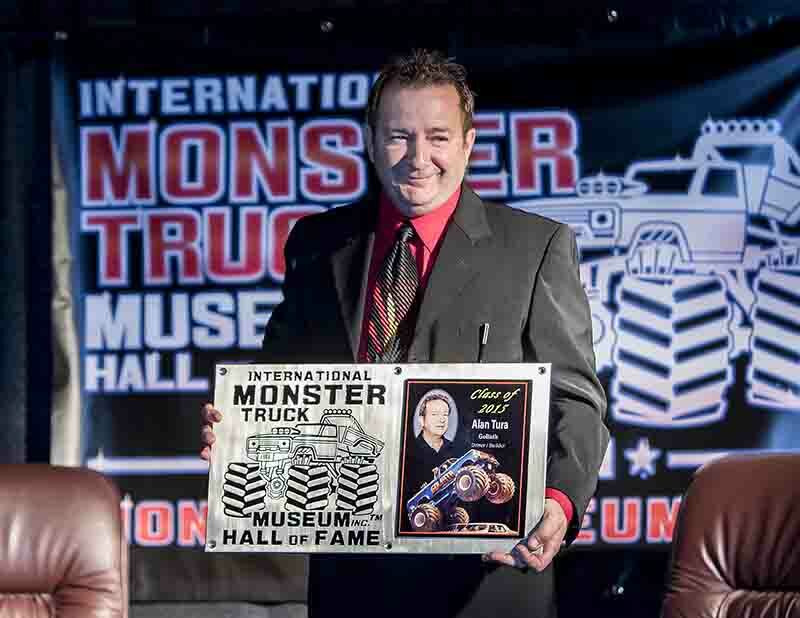 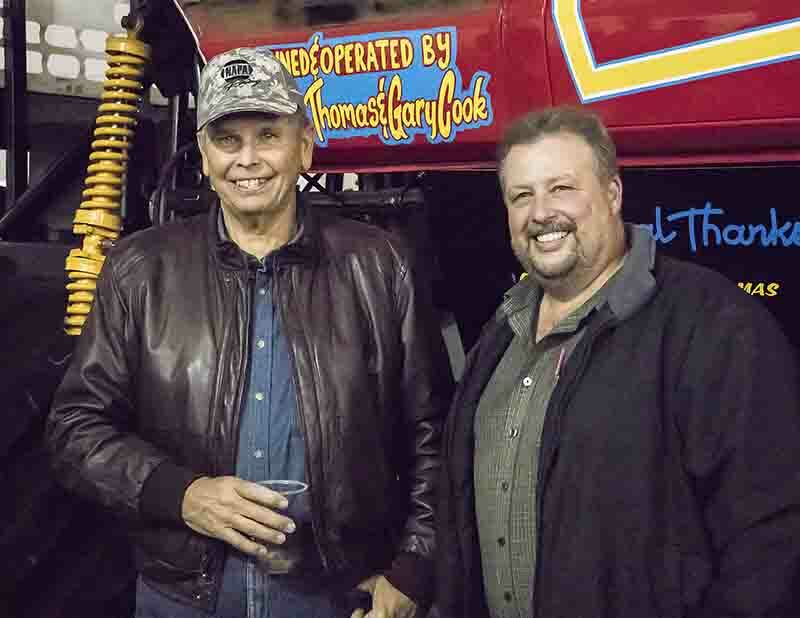 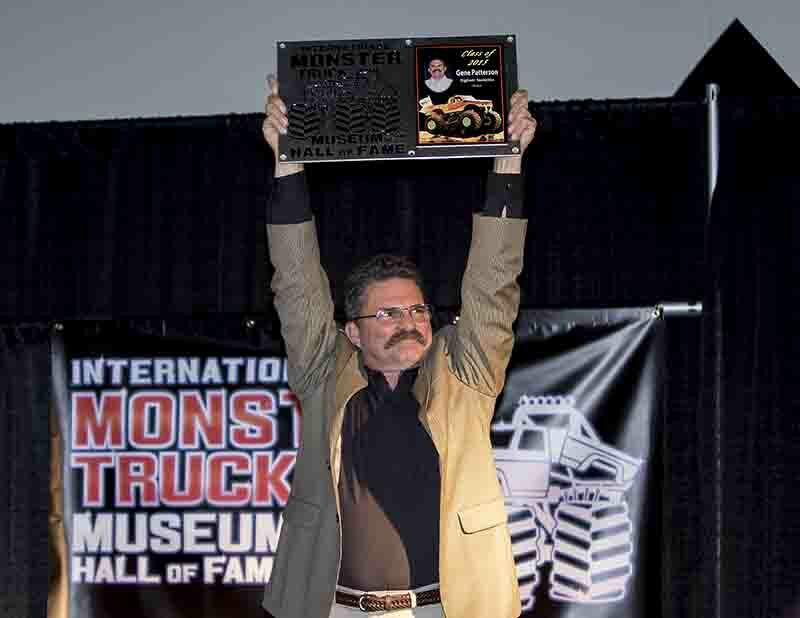 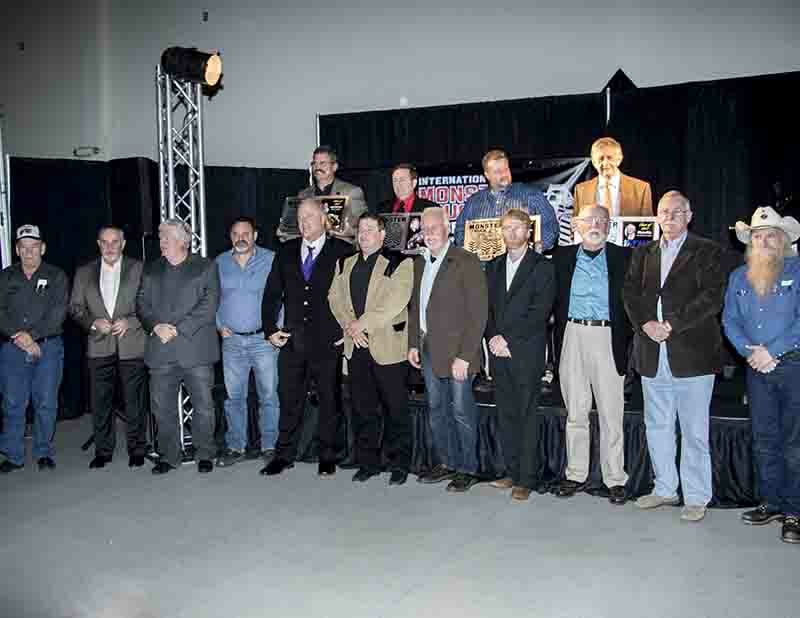 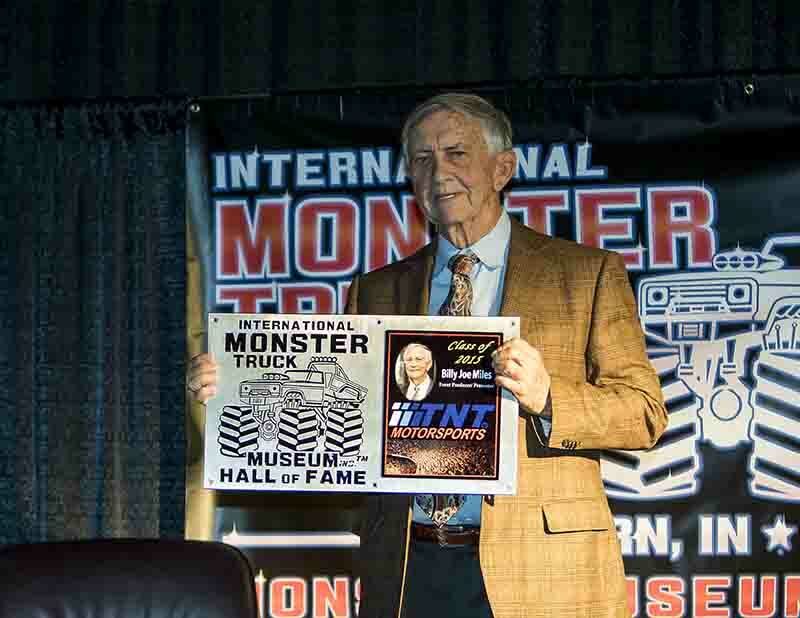 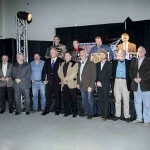 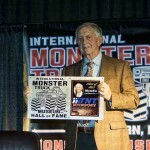 Well, we at “The Allen Report” are almost ready to catch a plane to Auburn, Indiana, home of the fifth Annual International Monster Truck Museum Hall of Fame Induction Ceremony & Reunion, where four legendary monster truck personalities will become enshrined into the Hall of Fame. 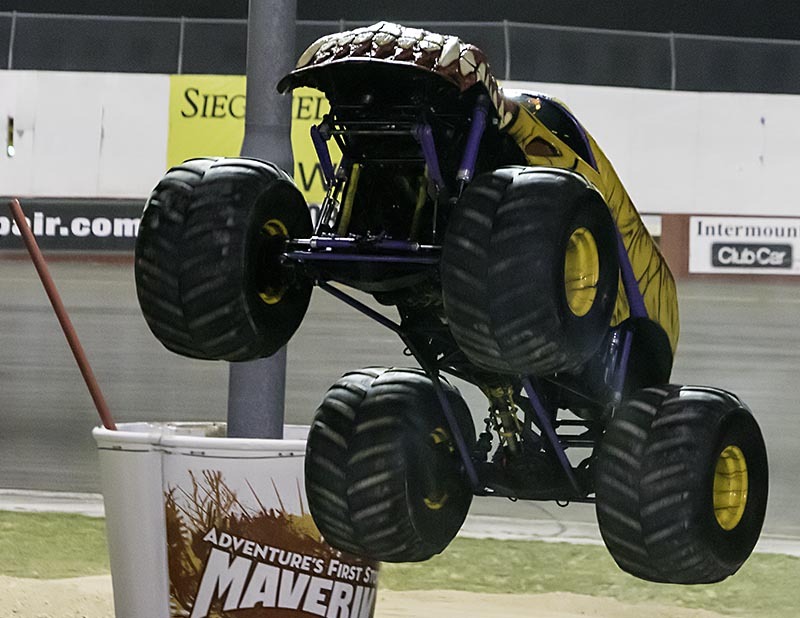 Thank you for reading, a sincere thanks to Zack McKinley and Grand Canyon State Promotions for having us, enjoy the photos and cheer on! 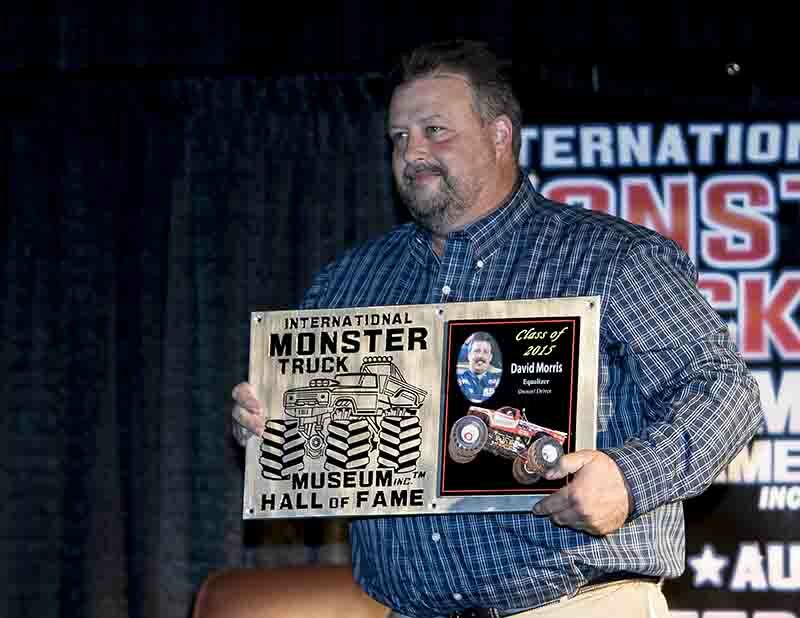 This time on “The Allen Report”, we make a short trip over to Globe, Arizona, a small town where mining, copper and quaint little shops are a natural part of life. 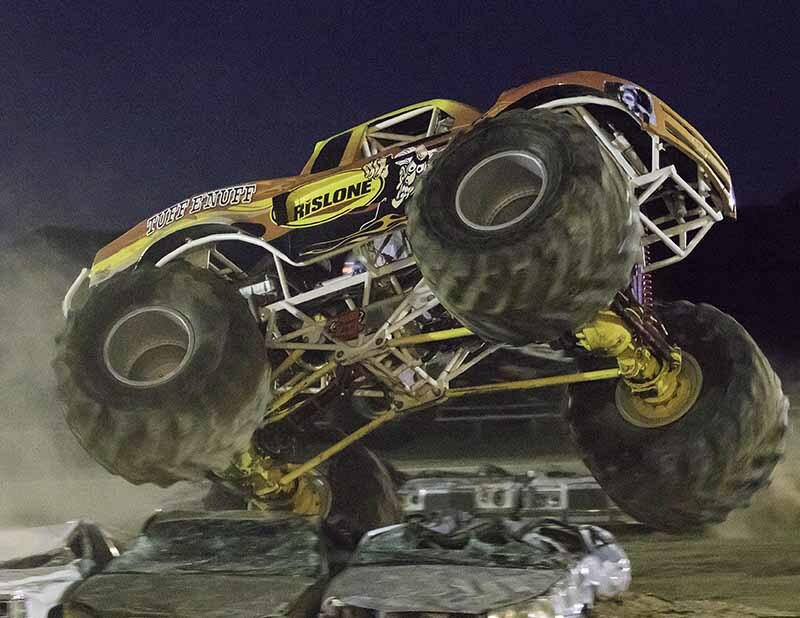 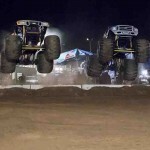 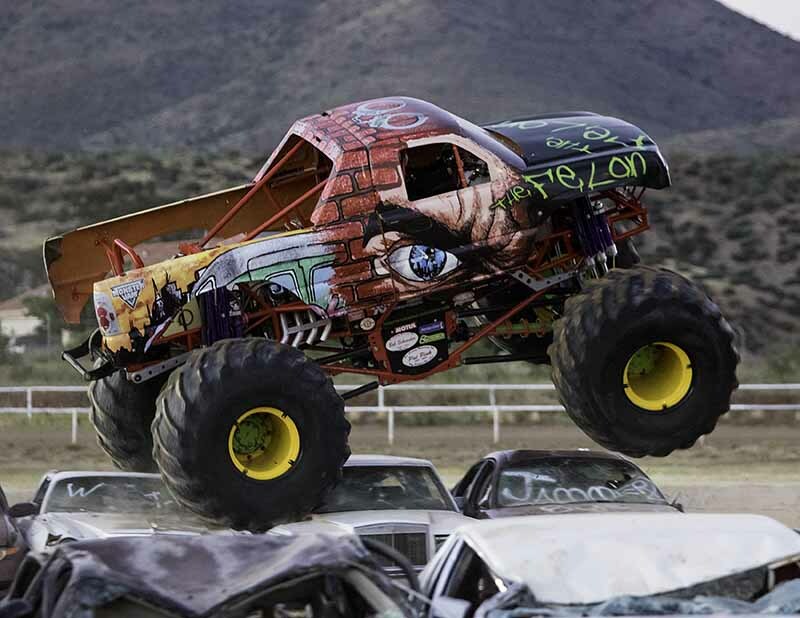 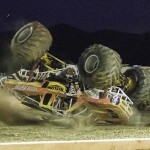 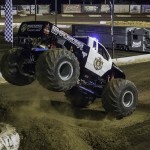 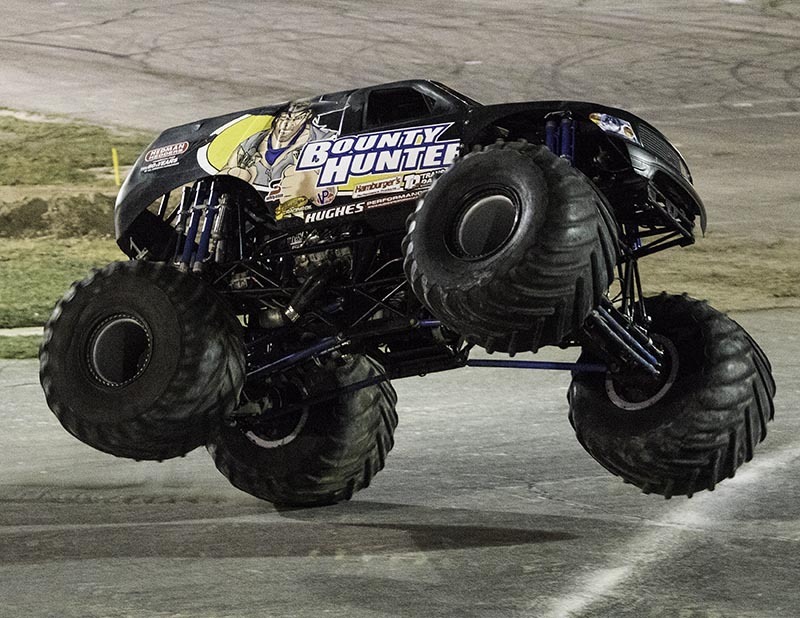 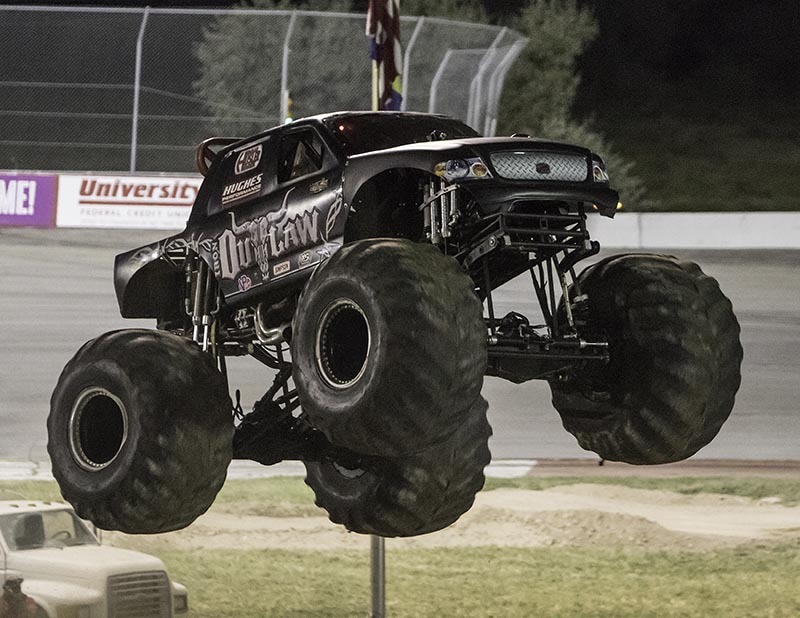 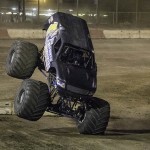 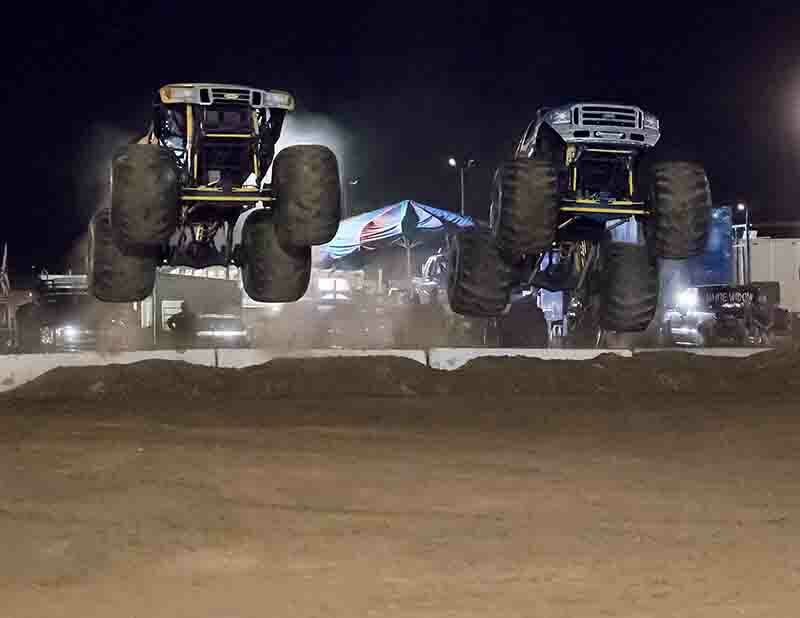 But on this night at the Gila County Fairgrounds, four gear grinding, dirt slinging monster trucks made their debut at the county fair to a packed and enthusiastic house. 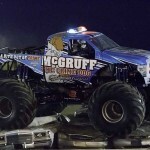 From just down the road in Marana, Arizona was Rod Wood driving McGruff, ready to take a bite out of the competition. 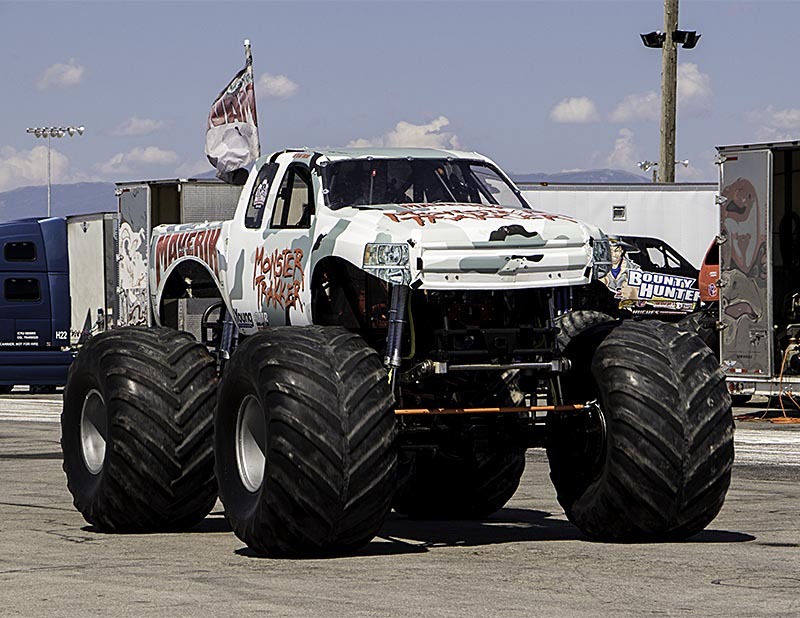 From the polar opposite side of the state in Parker, Arizona were Mark Schroeder and his truck convicted of mass devastation, the Felon. 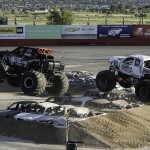 Finally, New Mexico’s Jack Koberna brought two of his trucks to the show. 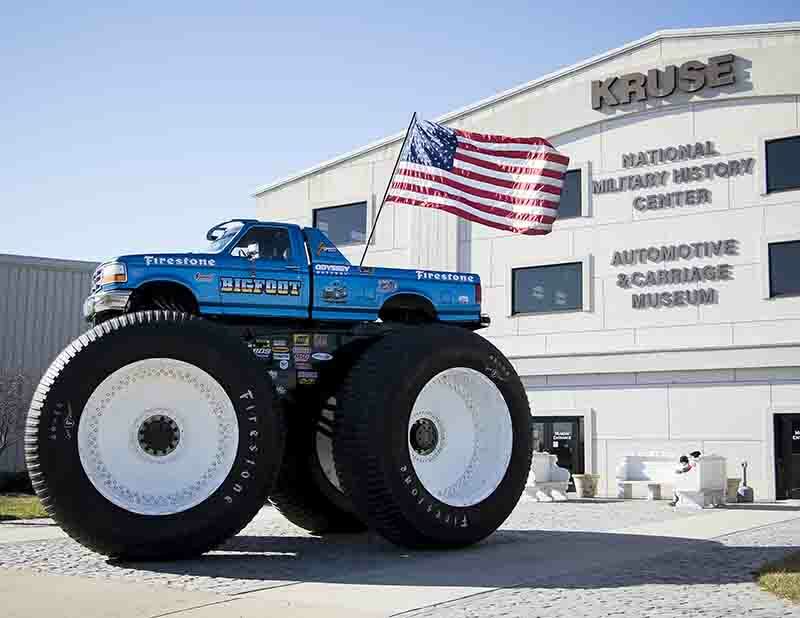 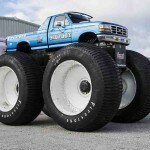 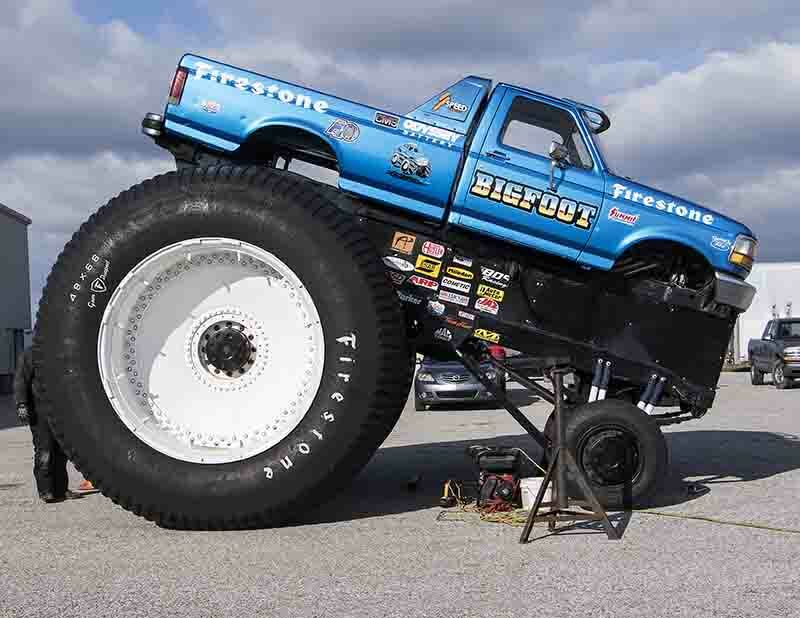 Jack himself drove the Rislone sponsored Tuff-E-Nuff while friend “T-Bone” took the reins of the world’s only two wheel drive monster truck, Cyborg. 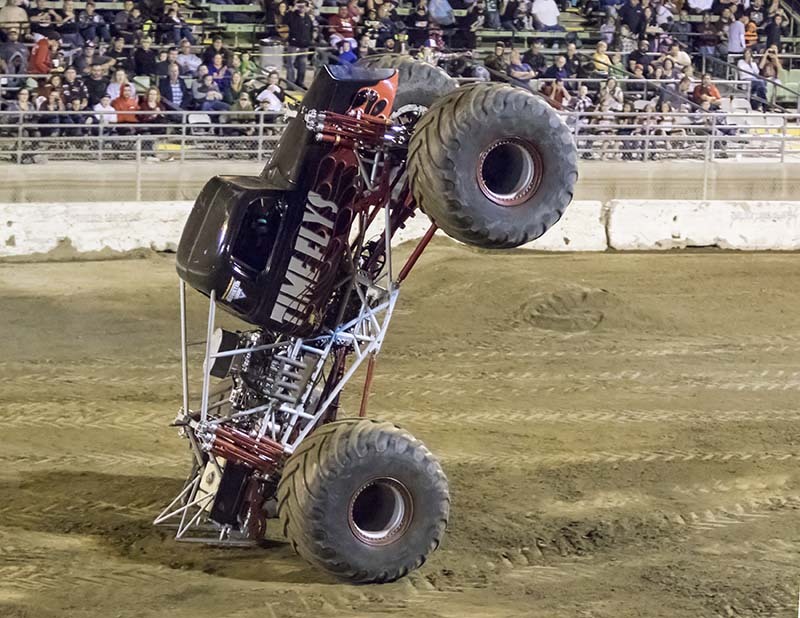 A standing room only crowd took to the grandstand to watch wheelie contest, Chicago style racing and car munching, high flying freestyle. 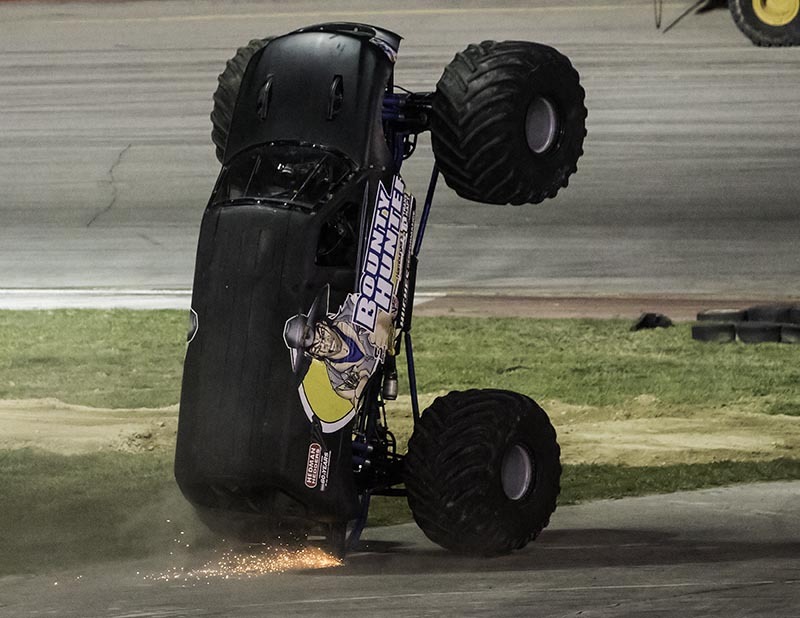 By hitting the cars the wrong way, wheelie contest was sure to be interesting. 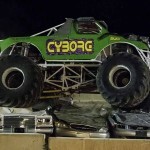 Cyborg was first out and gave very good efforts. 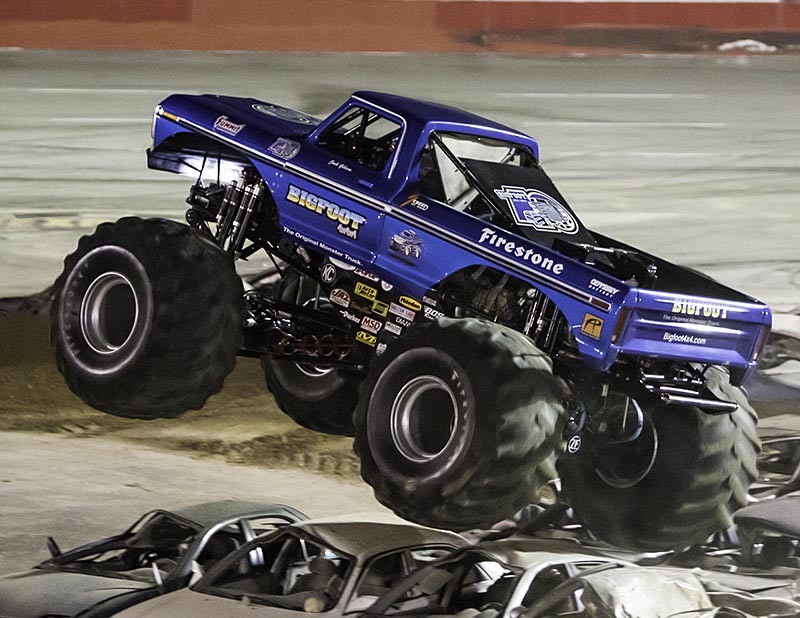 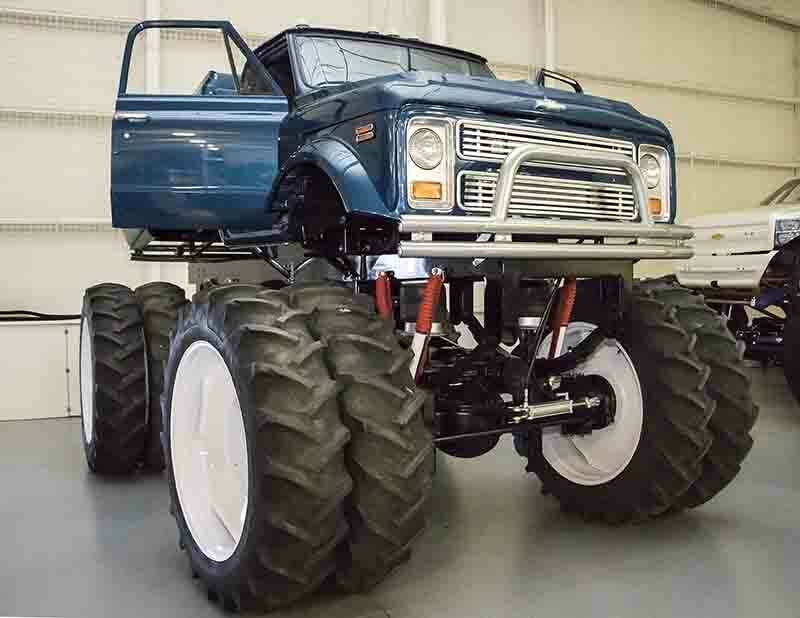 Felon set the bar for both trucks to come with a pair of very good forty-five degree angle wheelies. 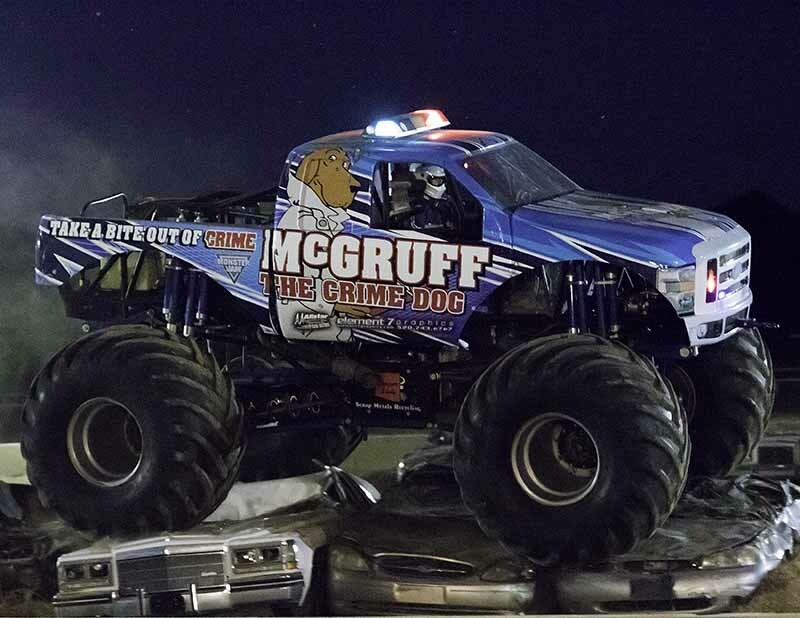 McGruff, police LED lights flashing brightly, gave excellent attempts hoping to win over the fans. 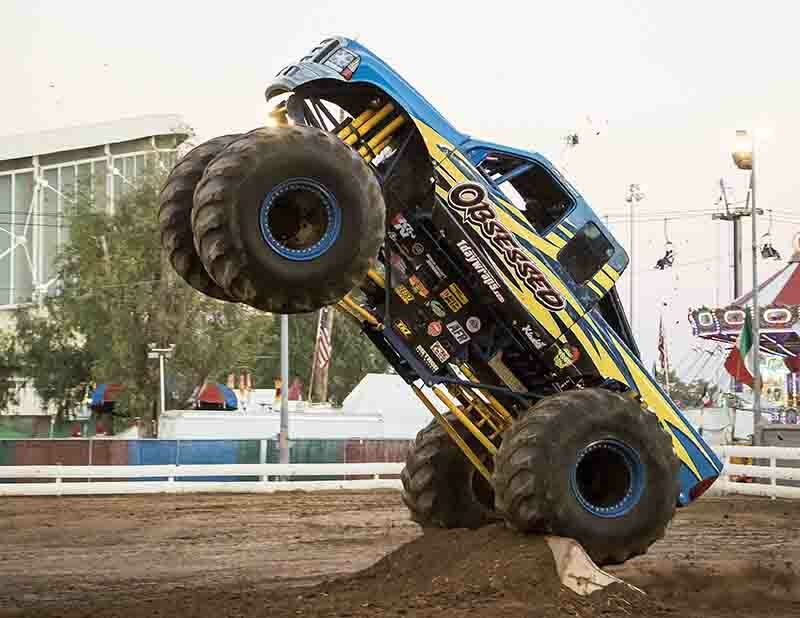 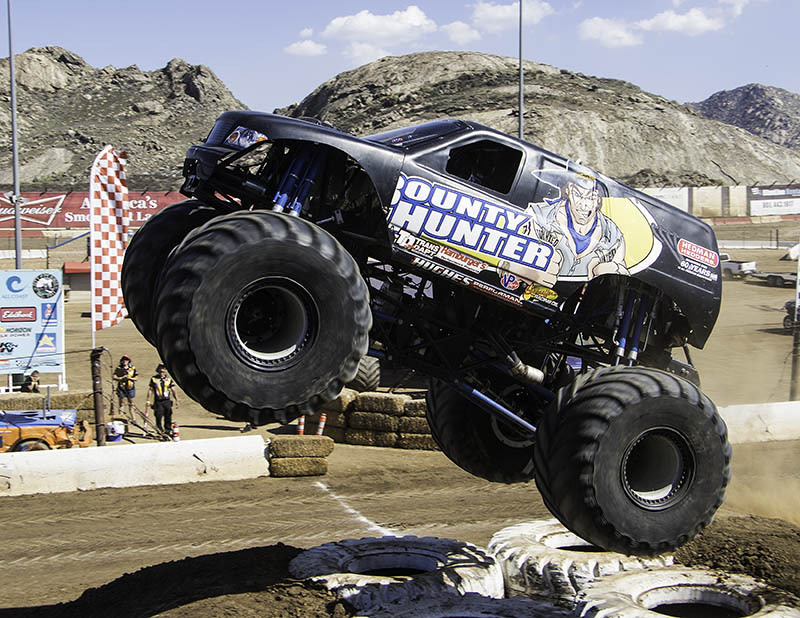 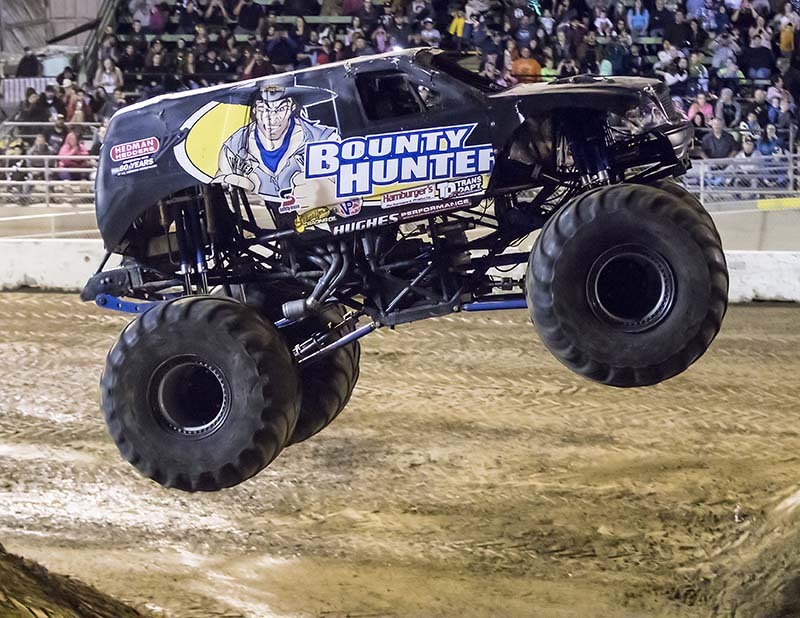 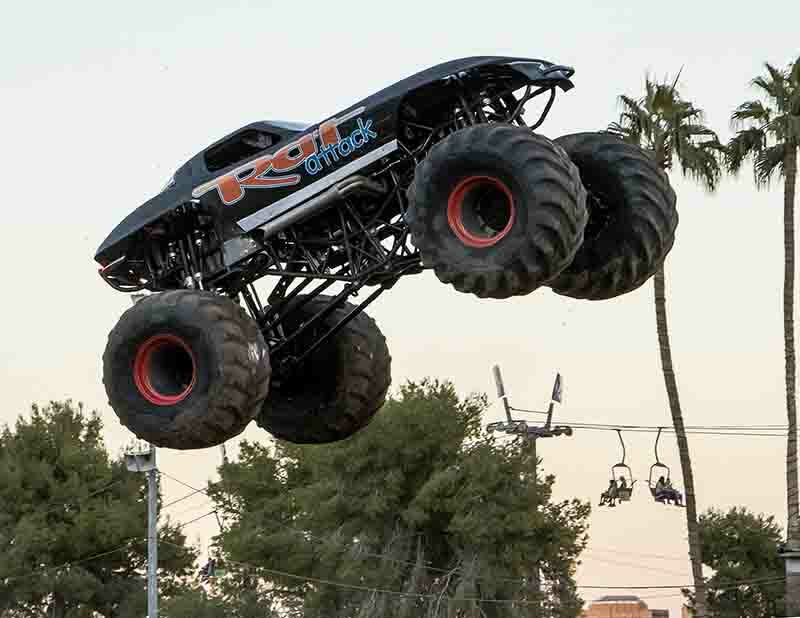 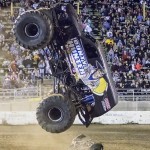 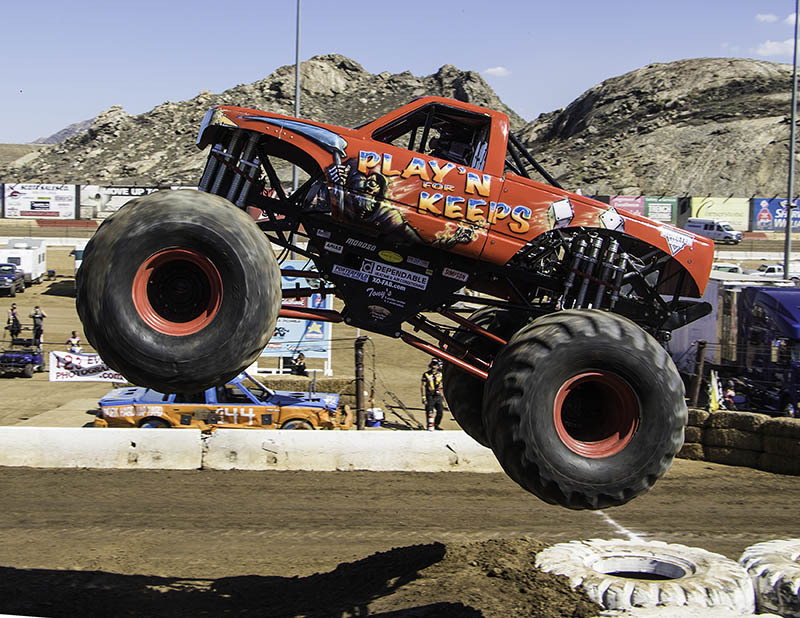 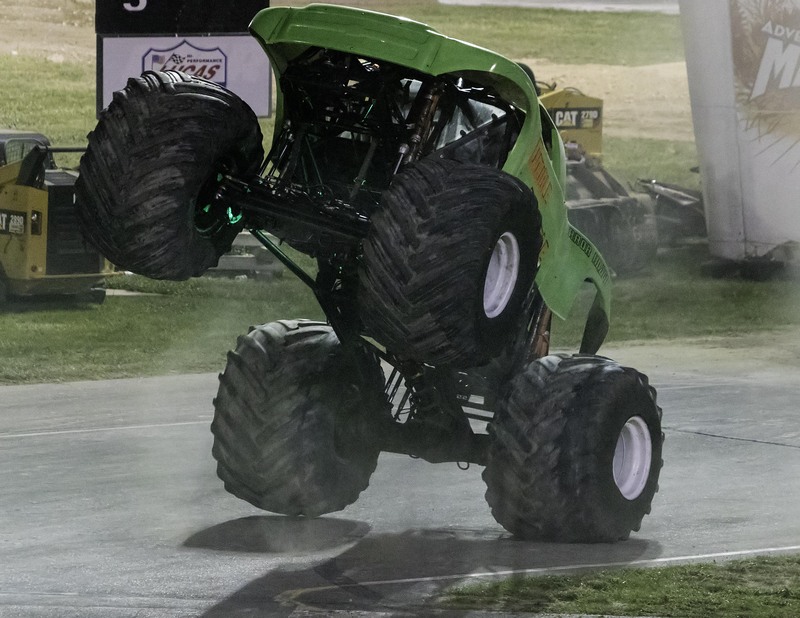 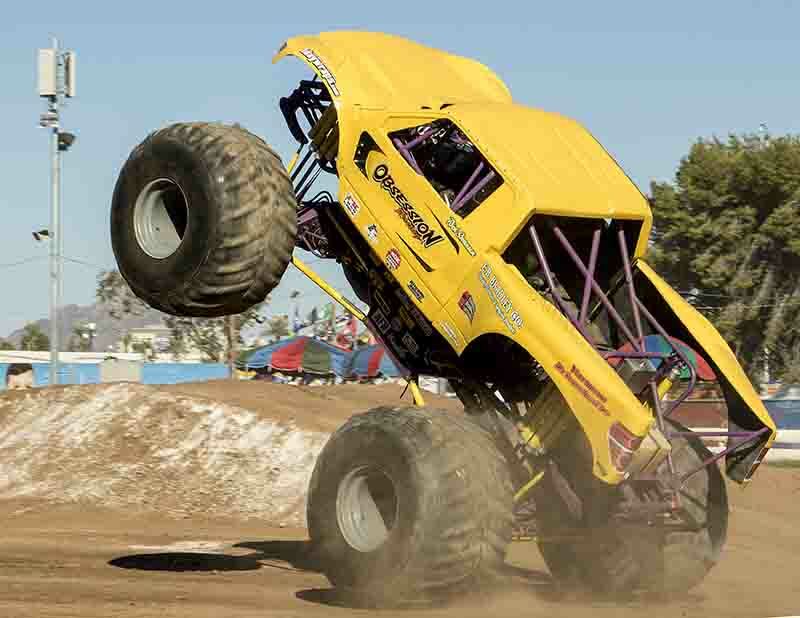 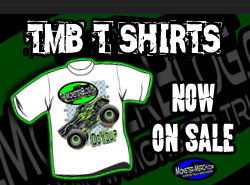 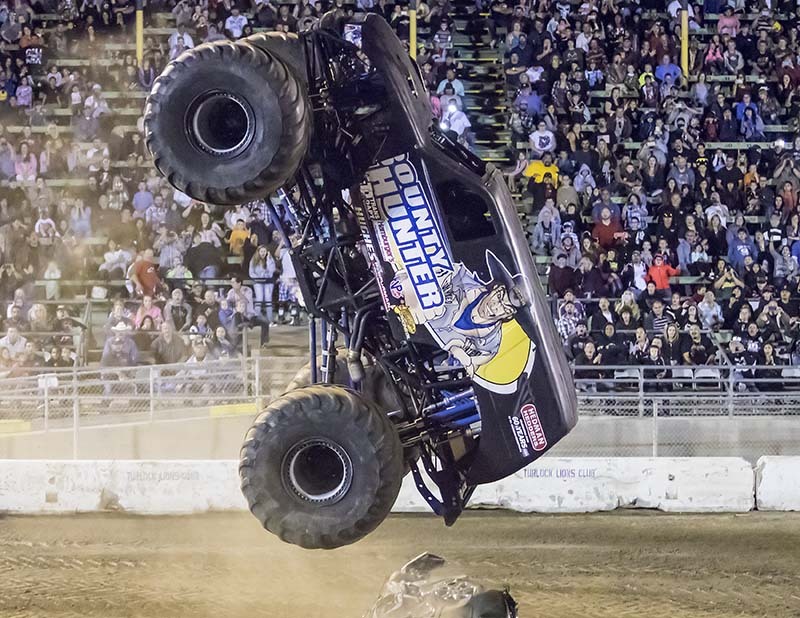 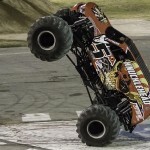 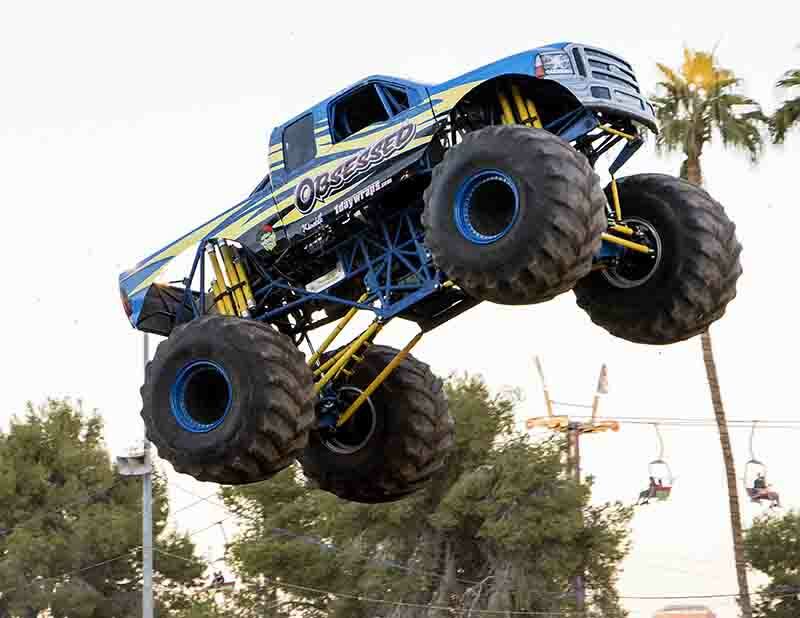 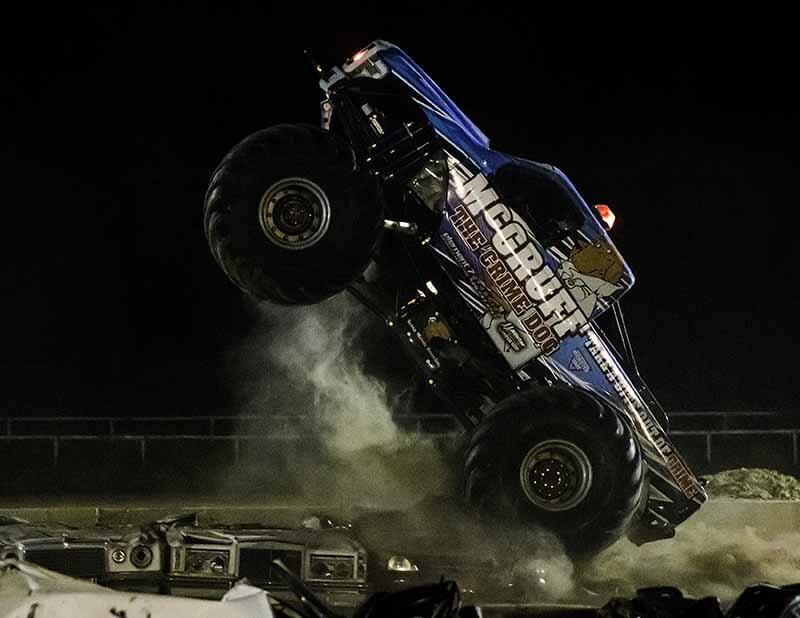 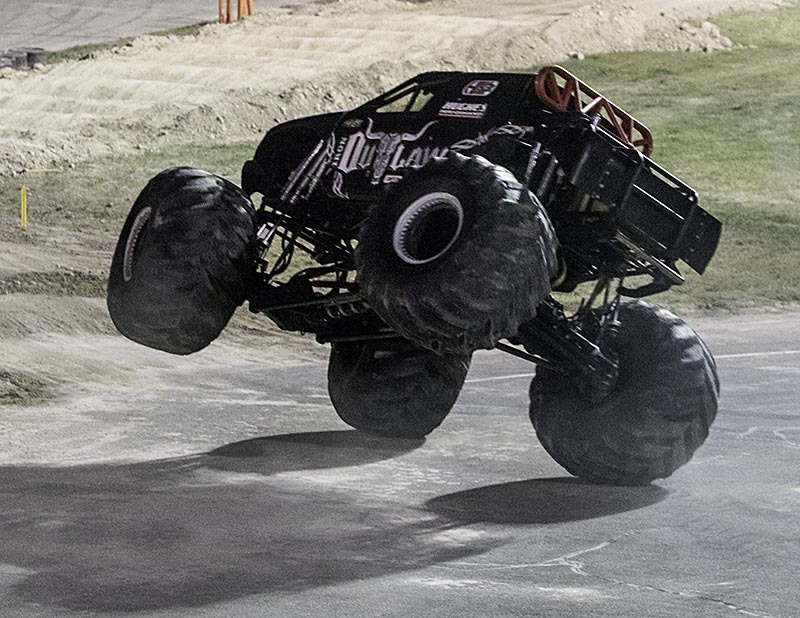 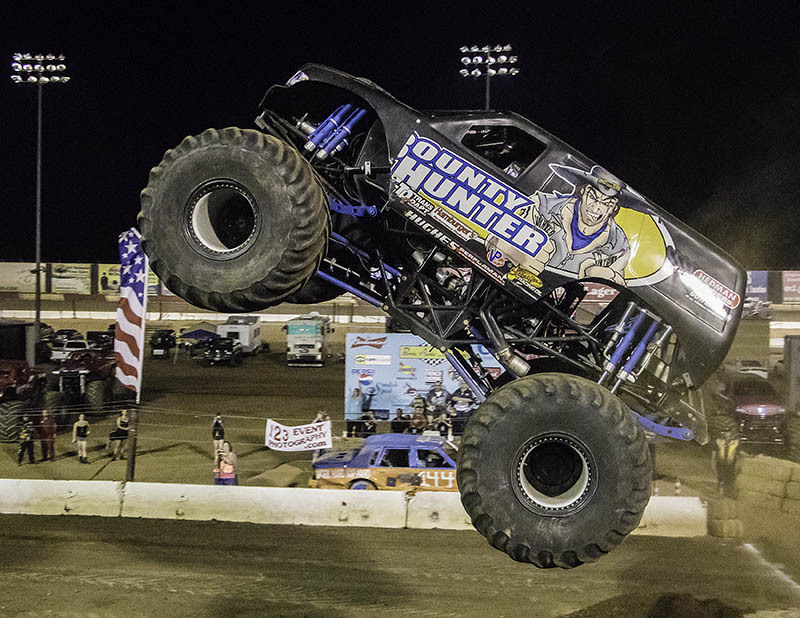 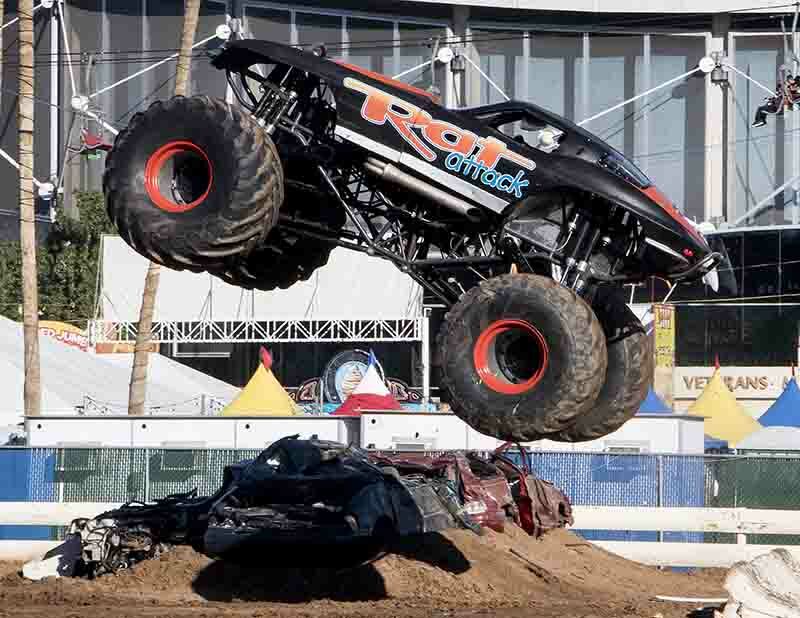 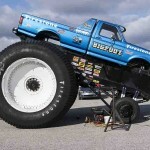 The monster truck legend from New Mexico Jack Koberna only continued the game of top this with a good sky wheelie then followed it up with an amazing slap wheelie that put the crowd on its feet. 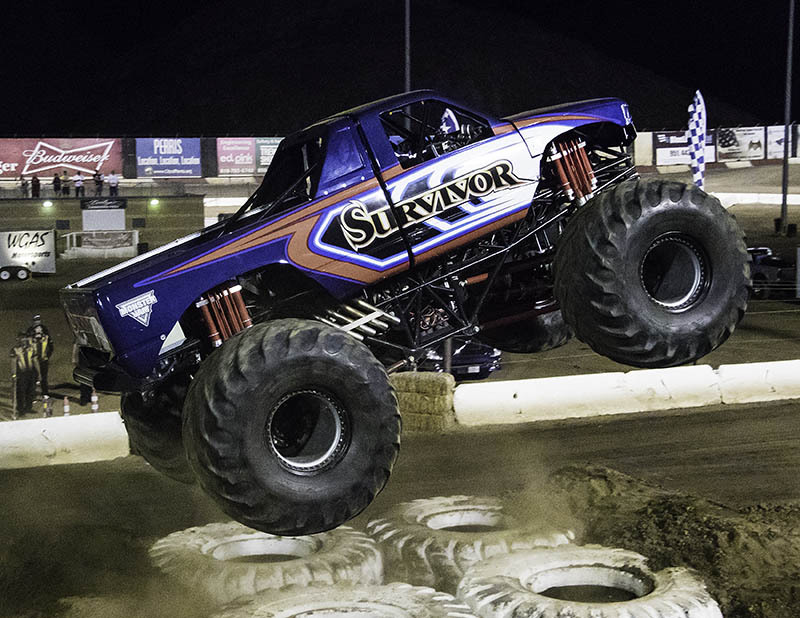 No official winner was crowned, but the fans cheered on for all competitors. 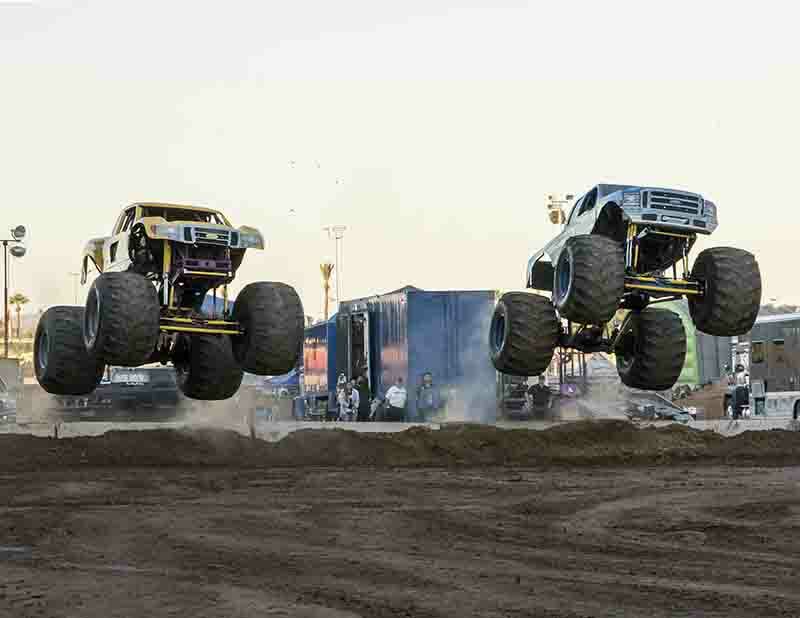 On to side by side racing, where only two jumps as opposed to the regular three were needed to achieve victory. 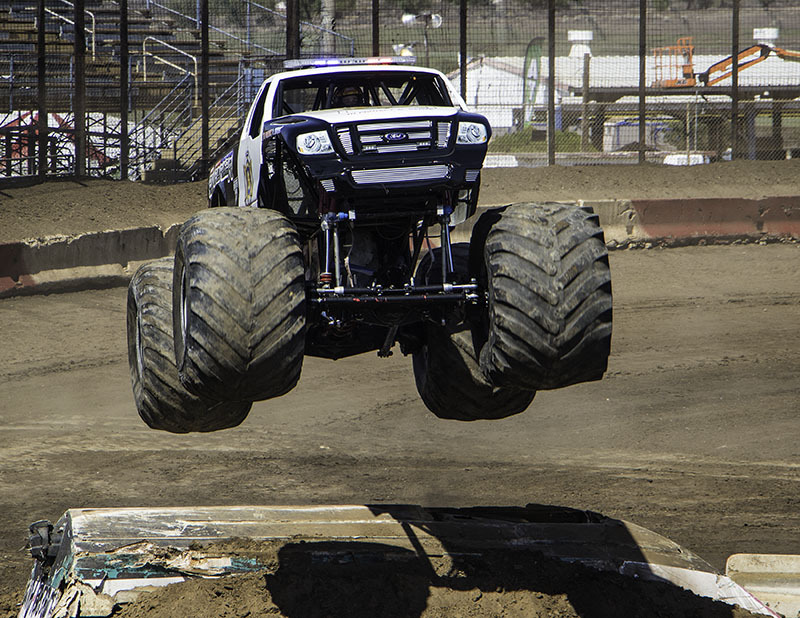 In the first heat Felon defeated Cyborg in a clean cut, straight up manner to advance to the finals. 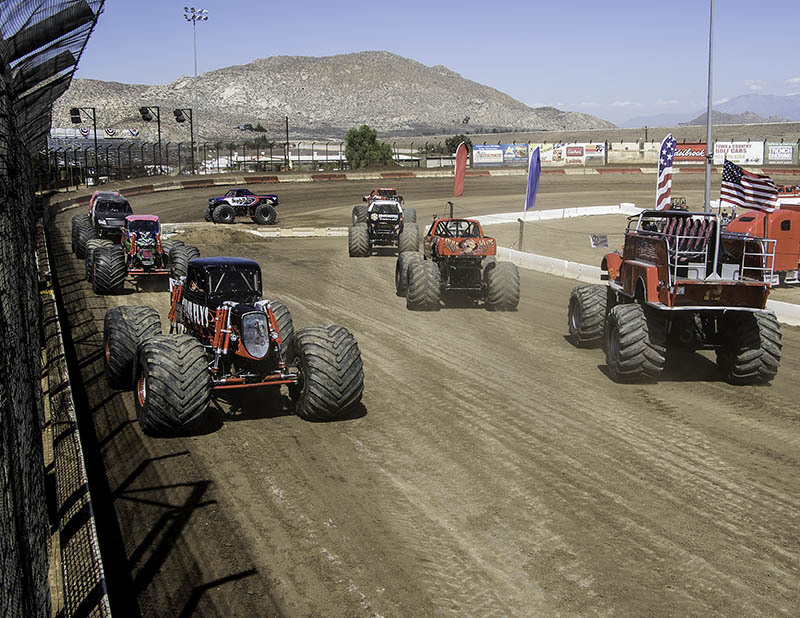 The second heat was one to remember. 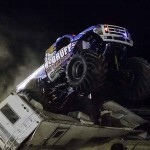 Going through the one and only turn, Tuff-E-Nuff went wide and smacked the freestyle van stack with one tire. 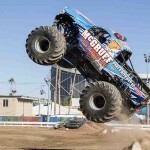 Not wanting to lose, Jack stood on the throttle to barely beat opponent McGruff. 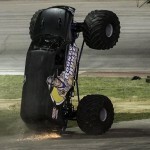 However, his rear tires had not centered up from the turn. 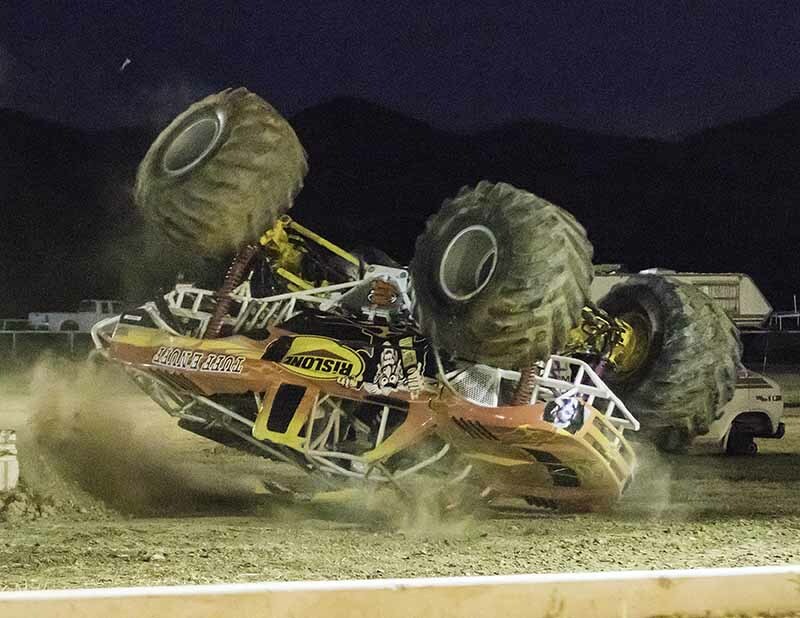 This sent the Chevy trophy truck into a nasty sideways rollover and it continued rolling until it was back on its wheels, causing the crowd to erupt. 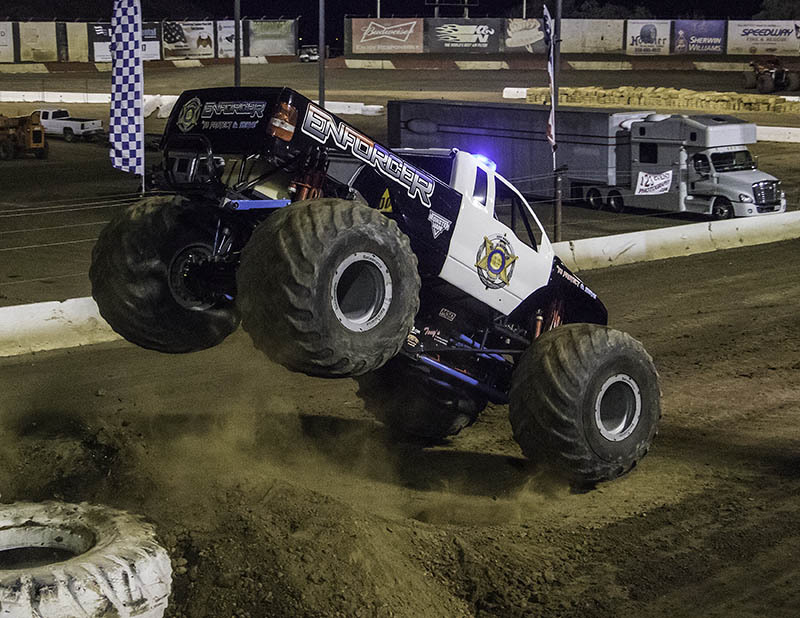 Despite the good show, McGruff was kept on the floor and officials sent Felon out to get the finals in the books. 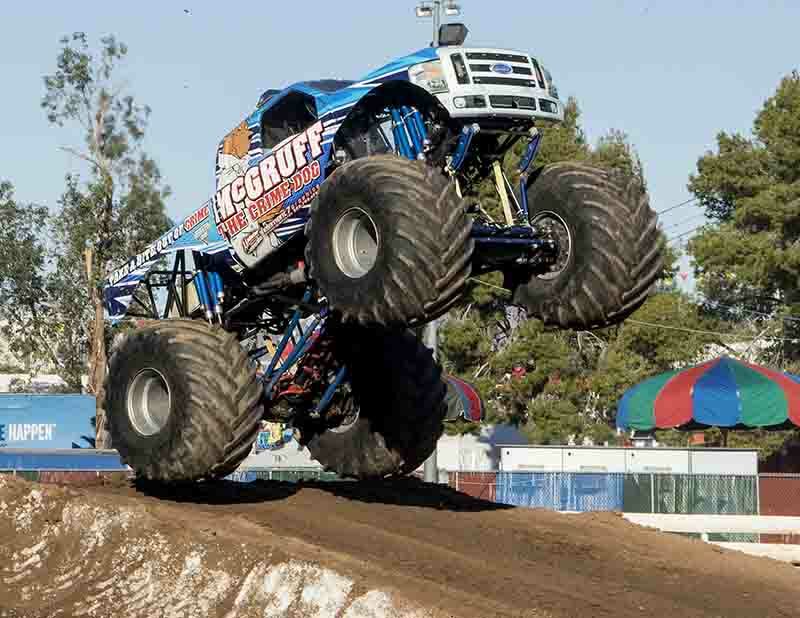 The final race was too close to call and with no official line judges or designated finish line, the fate of the race was put in the hands of the fans, whose loud applause was in McGruff’s favor. 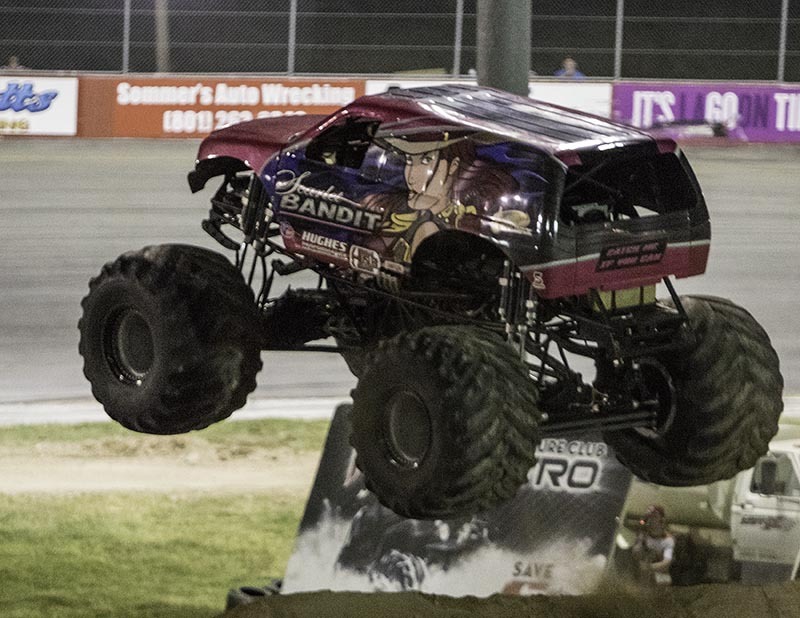 With that, we were on to the main event of freestyle where Rod Wood put together an unbelievable run by smashing both the motor home at one end of the floor and the van on the other, big jumps over the cars and dusty cyclones to ongoing cheers from the crowd. 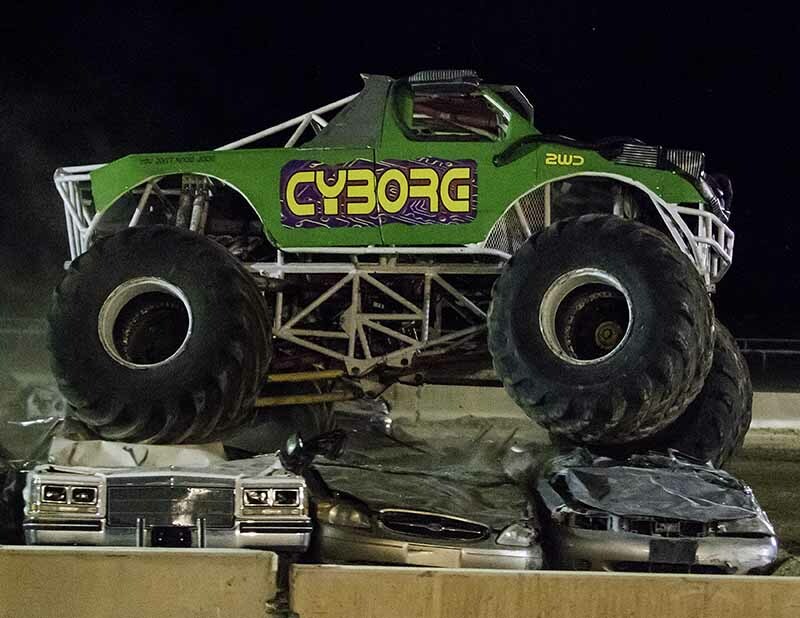 Cyborg had a good hit over the van and decent sky wheelies going when driveline issues forced the monster’s pilot to end his run early. 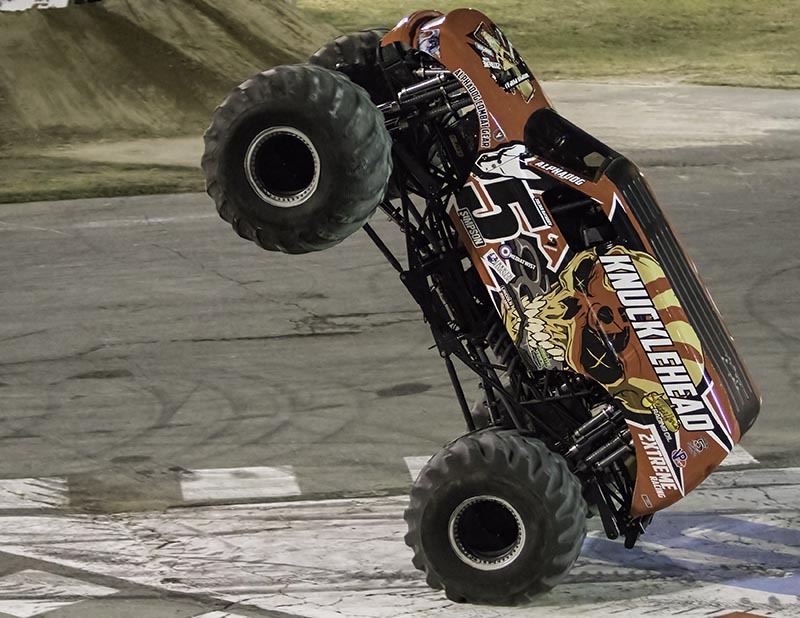 Mark Schroeder and Felon only raised the bar higher still with wheelies, donuts, and even a couple jumps using the floor boundary construction barrier as the ramp. 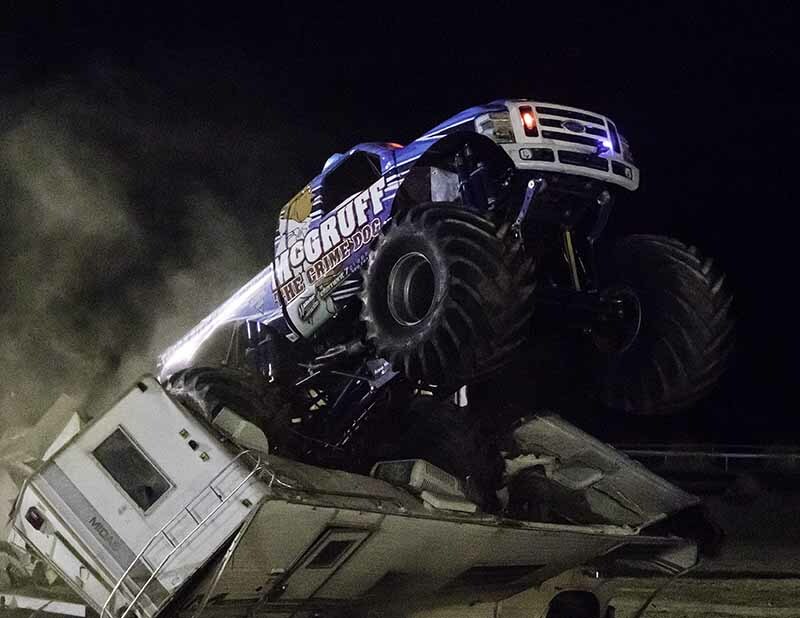 Finally, Tuff-E-Nuff fought a broken sway bar by doing some excellent cross thread moves over the cars and van, destroying what was left of the motor home and culminating in donuts that went on and on until you couldn’t see the monster. 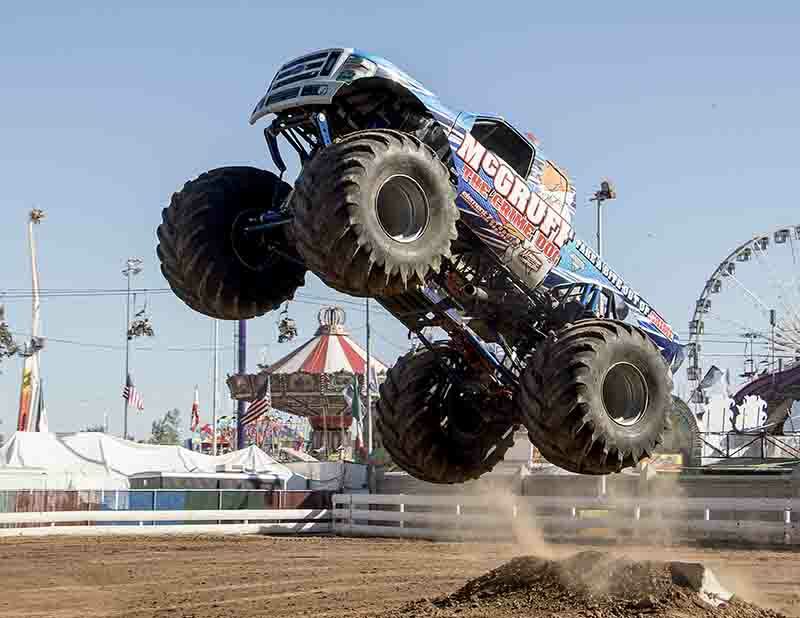 Despite the lack of freestyle winner, the beyond capacity crowd, well used to demolition derbies were extremely approving of the first monster truck outing at the fair. 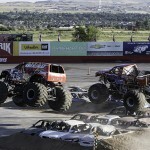 In between monster action was one at a time, vehicle versus clock mud bog racing. 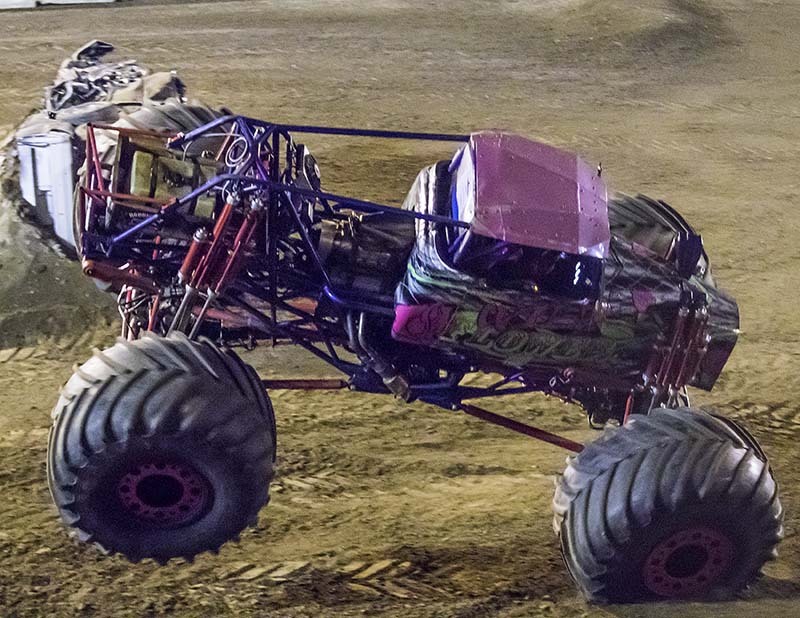 After a slow start, many of the vehicles made it to the other end of the pit, often with increasingly faster times. 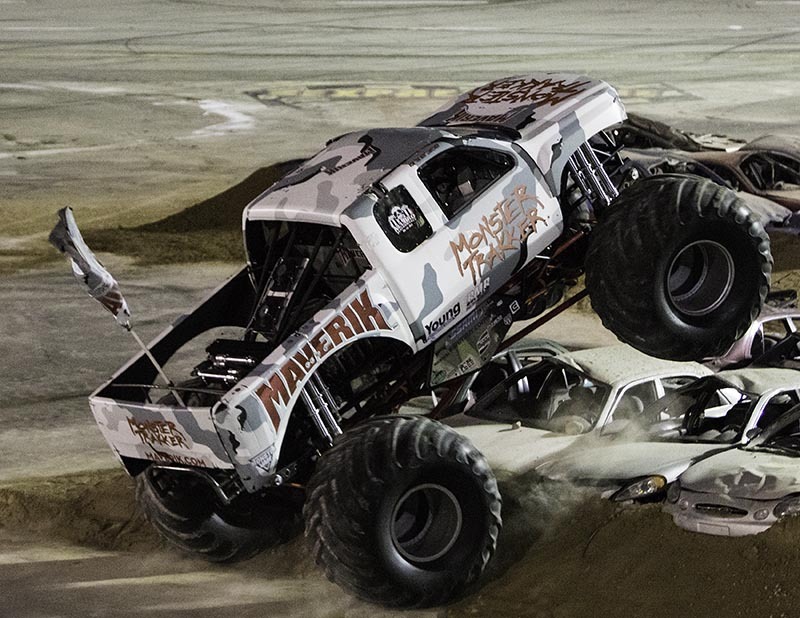 As dirty as it was, the fans loved it. 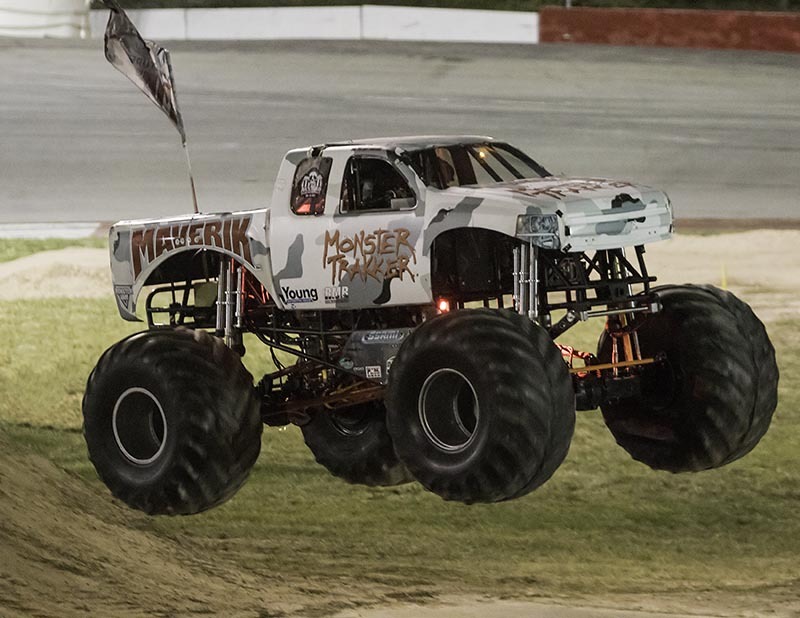 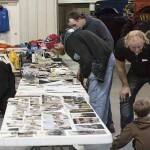 As for us at “The Allen Report”, you will next hear from us at some of the biggest shows our friends at WGAS Motorsports put together all year, the Southern California Fair in Perris. 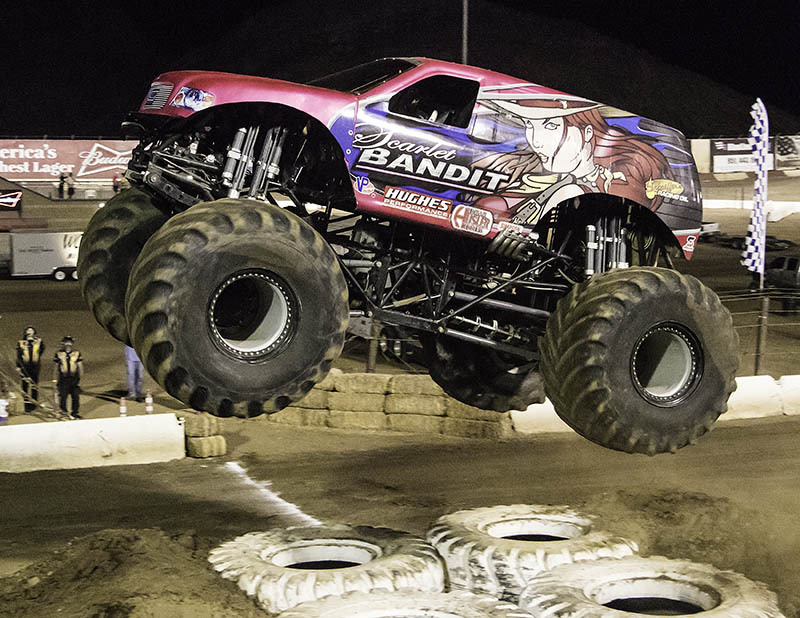 Till then, thank you for reading, a special thank-you to the Gila County Fairgrounds for hosting us, enjoy the photos and cheer on!